We were up late today, we didn't have to check out till 12 so there was no rush. We all voted for Perkins for our final breakfast in Orlando having been really impressed with our previous meal there. It was very busy this morning but we hoped that this was a good indication of the quality of their breakfast offerings. ... 2 slices of French Toast and 2 pancakes! 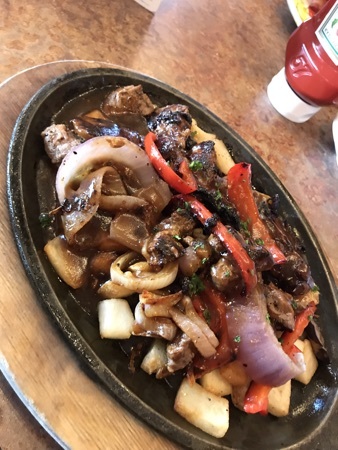 I had a skillet of steak tips, mushrooms and peppers with farmhouse potatoes in gravy. This wasn't actually on the breakfast menu but that wasn’t a problem and it was delicious. DD only wanted toast and some fries. 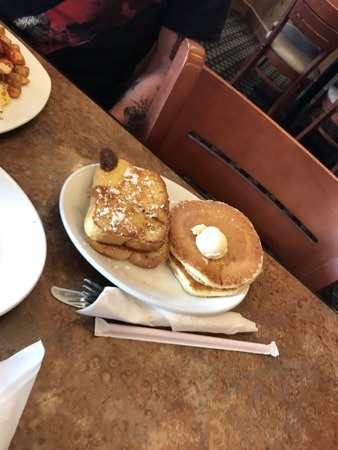 We all 3 shared the unexpected French toast and pancakes but we still couldn’t finish it all - it was just way too much food! The meals here really are excellent quality and value. We all wished that we’d tried it much sooner in the holiday but agreed that, if we had, we probably would never have eaten anywhere else. I’ve lost the receipt but it cost approx $35 including tip. After breakfast we returned to our room, finished packing and checked out of the hotel. 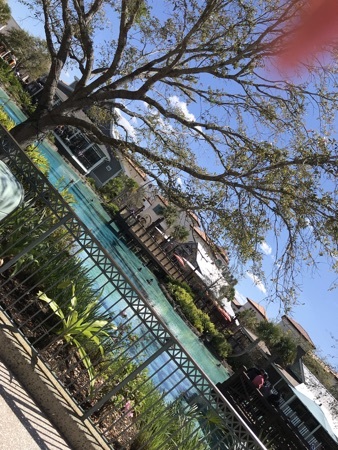 We left our luggage in storage at the hotel and headed for Disney Springs to enjoy our last bit of Florida sunshine. We were dropped off at West Side next to the old Cirque du Soleil building. 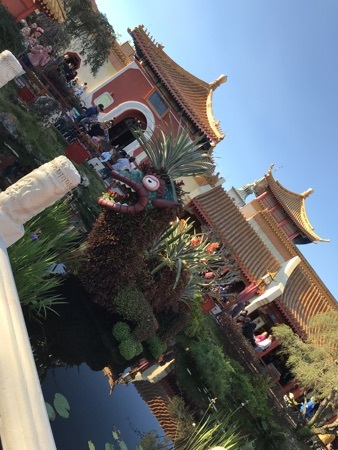 We strolled through to the Market Place admiring the new theming and landscaping - when we were last here it was still Downtown Disney. First stop was the Lego shop we took lots of pics of the impressive models but DD decided against adding to her collection. We then headed to the World of Disney, where we spent ages just looking at the vast array of stock. 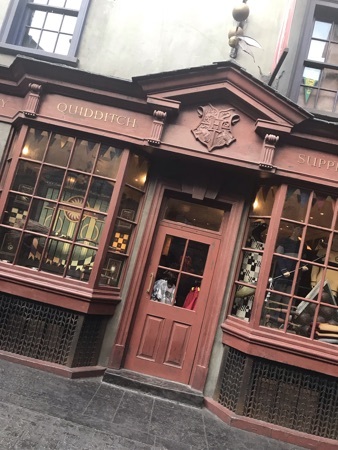 I'm not sure what to make of the changes to this shop. It is easier to find what you're looking for with the new layout - I've been known to get lost in here before - but it seems to have lost some of the magic somehow. This gorgeous Minnie Mouse clip with crystal bow for $90. We slowly made our way around the shops. 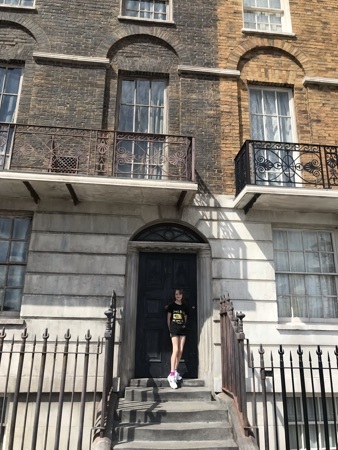 I wanted to visit Once Upon A Story. I remembered DS20 and DD18 getting Mr Potato Head boxes from here when they were younger where they could buy as many accessories as they could fit in a box for a fixed price - I think it was about $20. DGD is now into Toy Story and has both Mr & Mrs Potato Head so I hoped that they still did a similar deal. I was disappointed to find that they didn't and that the shop is only about half the size that it used to be. We sat by the lake just people watching and enjoying a final ice-cream. 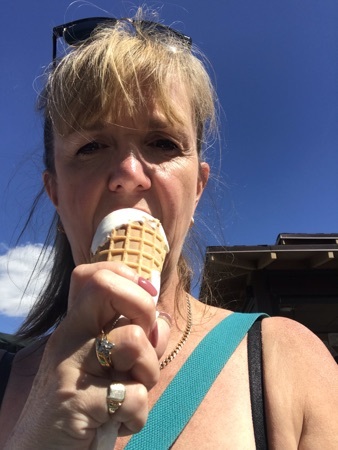 Just making the most of the beautiful weather. By 3pm we reluctantly decided that it was time to call an Uber to take us back to the Rosen Inn for the last time to collect our luggage. We were at MCO by 4pm and checked in for our flight very quickly. We spent some time in Duty Free doing our last bits of present shopping to take home for DS33, D-i-l and DS20. Unimaginative maybe, but when inspiration runs out cigarettes and booze always go down well! We went to Burger King and got DD a meal as she'd eaten so little of the plane food on the outbound journey. 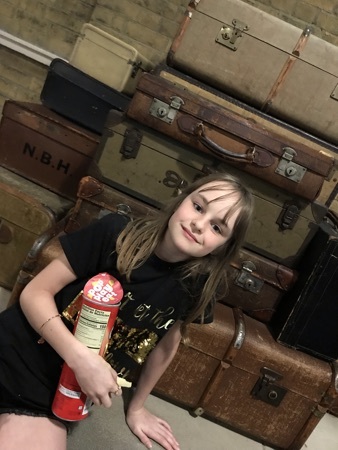 We also bought her a colouring and activity set, some bottles of pop to take on board and a Lunchables Snack Pack in case she got hungry during the flight. The flight took off on time. 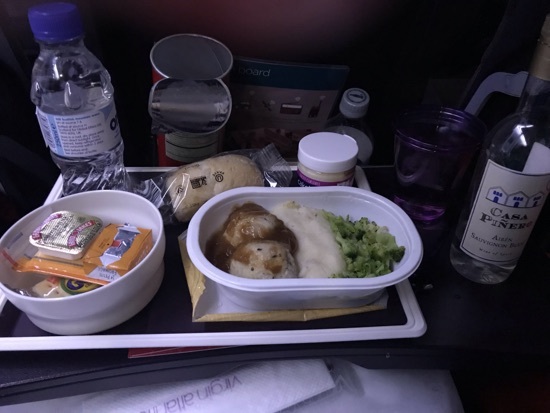 We were served with drinks and pretzels almost as soon as the seatbelt signs went off - I had a vodka and coke as I hoped that it might help me sleep! ... chicken meatballs with mashed potato and broccoli. We both ate it but, honestly, what is the point of giving out menus if none of the options are available? It was served with a bread roll, crackers and cheese. I also got a glass of white wine. 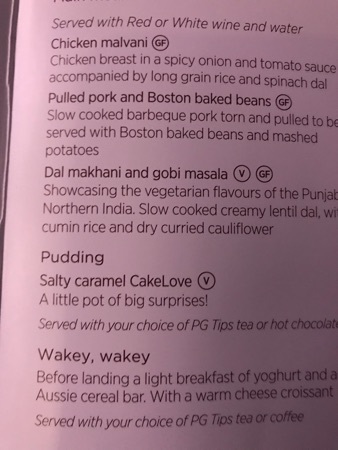 It wasn't the best meal that I've ever had but it filled a gap. As with the outbound flight, the dessert (which was as advertised) was the best bit. 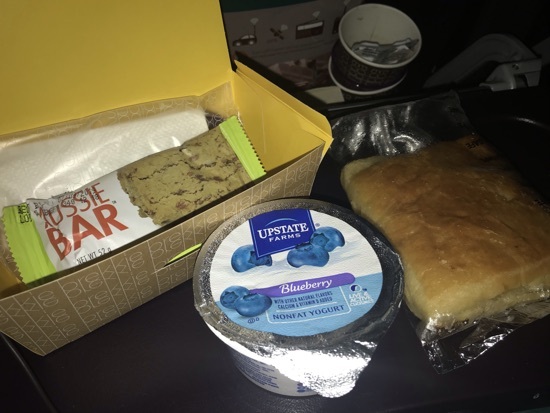 We needn't have worried about DD getting hungry as she spent most of the flight like this! DH snoozed and watched a couple of films including Braven which he enjoyed. I always struggle to sleep on a night flight so settled down to watch The Jinx which I'd read good things about on The Dibb and was really looking forward to. We made good time across the Atlantic and the crew announced that we were on schedule for a 7hr flight. Breakfast was served at about 6am (UK time) and consisted of a blueberry yoghurt, an Aussie bar and a hot cheese croissant. This was all pretty awful! The croissant was too hot to eat when first served but solid and rubbery when cooled. None of us bothered with much of it. 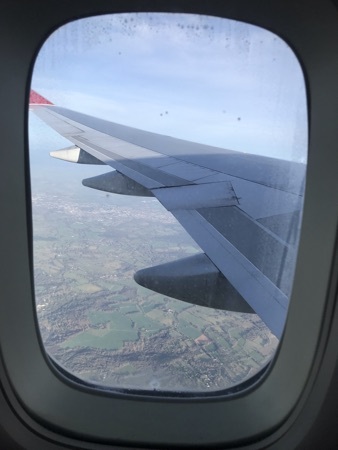 We were soon descending into Gatwick. Although it was great to land earlier than expected, I still had 30 minutes left of my box set to watch so now need to find a way of watching the ending in the U.K.! We were quickly through passport control, baggage reclaim and customs and back at the car. We actually left the car park at 9.30am - only a few minutes after we were originally due to land. After an uneventful drive we are finally back at home and unpacked. Now just to catch up with all the family and plough through the mountain of washing... not just ours, but also what DD18 and DS20 have managed to accumulate over the last two weeks! When we've settled back in I'll be back with some final thoughts and future plans. Thanks to all those of you who’ve read along with our adventure! This morning none of us were up before 8am. The plan was for a lazy morning and then a return to Epcot later this afternoon to end the final night of the holiday watching illuminations. The weather today was bright and sunny although not much warmer than yesterday. 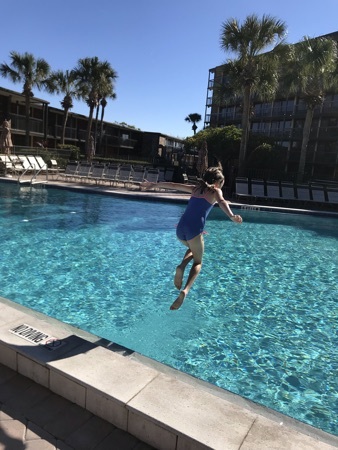 DD was keen for a last swim and we wanted to encourage her new found confidence in the water so when we were all ready we headed down to the hotel pool. We all had fun playing in the water for an hour or so. The water temperature was lovely but it was a bit chilly when you got out! 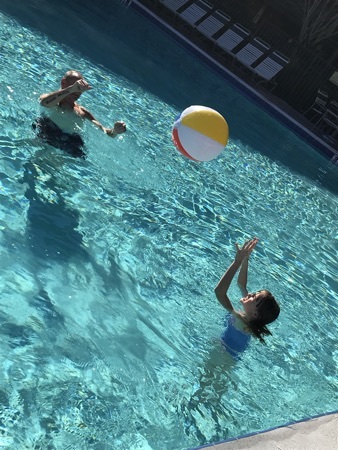 For most of the time we had the pool to ourselves. When we'd had enough we braved the air temperature and returned to the room where I started a bit of packing whilst DD & DH got dressed and showered. 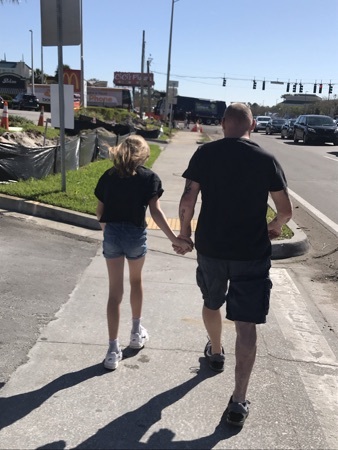 Once we were all ready we went for a last wander round the shops on I-Drive, stopping at Walgreens and picking up some sweets to take back for DD's school friends and the grandchildren. We long since stopped bringing back tourist tatt for the older grandchildren (aged 11, 12 & 14). They would much rather have the money to spend. 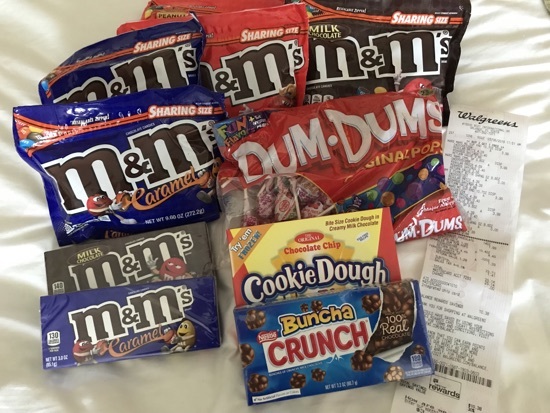 They'll get a big bag of M&Ms each + cash to the equivalent of what we've spent on the little one! For dinner today we decided to try somewhere different. 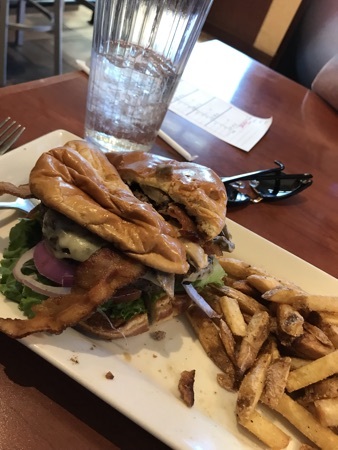 Due to the general apathy around food I still had a lot of unused vouchers and discounts codes, we looked at a few online menus before settling on O'Charleys where I had a $25 restaurant.com voucher to use that I'd bought for $5. This was a 10-15 min walk from our hotel up Sandlake Rd. - despite 2 previous stays at the Rosen, DH has never before ventured in this direction. DD18 and I did once walk all the way to Walmart on Turkey Lake Rd. just out of curiosity - I wouldn't bother again. Anyway, I digress, back to the food! 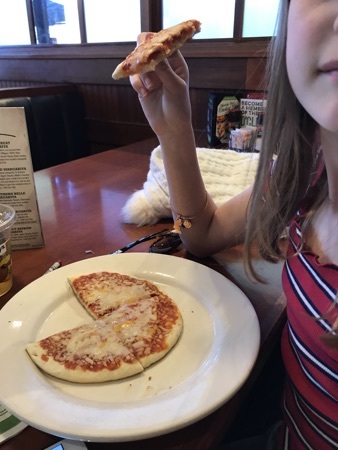 DD had another cheese pizza. 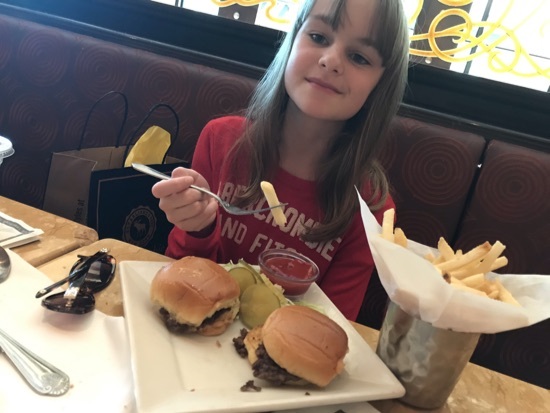 These burgers were nice enough but nothing special, they weren't as juicy or full of flavour as the ones that we'd eaten earlier in the holiday at Perkins so we were slightly disappointed. 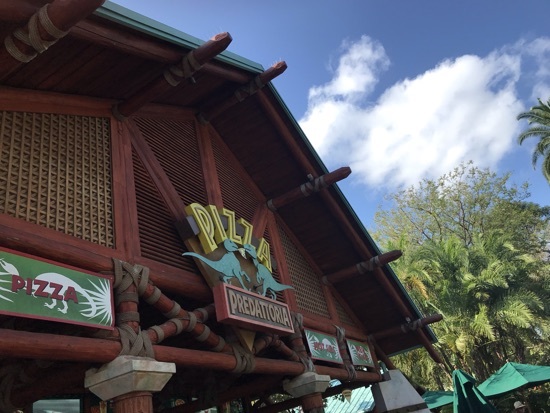 DD said her pizza wasn't as nice as the one she'd had in IoA the other day. No-one fancied dessert so we didn't spend enough to use the restaurant.com voucher after all! (There was a minimum spend of $50). Even with the tip we paid under $30 - I've lost the receipt so not sure exactly how much but the burgers were definitely under $10 each. 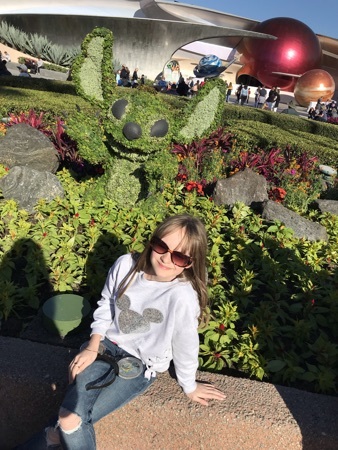 Our first FP wasn't till 3.50pm so we returned to the hotel and changed into jeans and hoodies before setting off to Epcot. As we were planning to stay till the end tonight we were expecting the temperature to drop further still after dark. We called an Uber, who are still offering 30% off, so this cost $11.36. By the time we arrived our FP window for Mission Space was already open so we headed straight there. We had originally been intending to all do the Green Mission together but DH decided that he didn't even want to do that so he opted to wait out while DD and I did the Orange. I must admit that it made me feel slightly queezy but DD was completely unfazed! 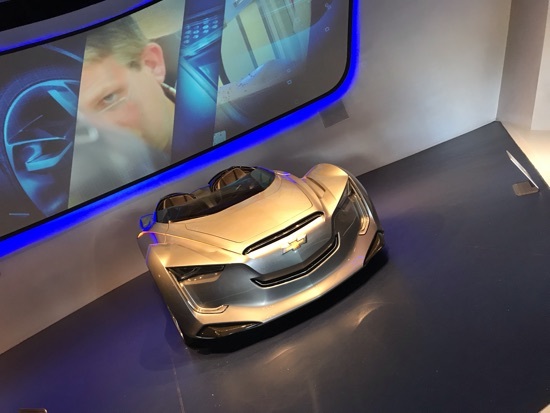 Our next FP, for Test Track, was opening in 10 minutes so it wasn't worth wandering away from this part of the park. We had a quick look in Innoventions but were pretty unimpressed by what is left in there so we took some pics of the topiary - Stitch, of course being DD's favourite. The time passed quickly and we were soon inside Test Track. We let DD design the car. 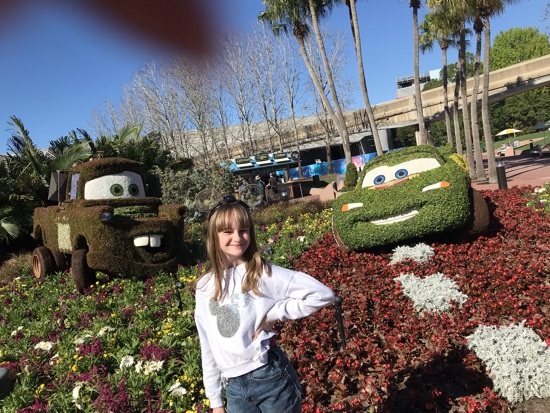 She loved doing this but was disappointed that the ride vehicle didn't actually look like her car! We won on the power score but came last on everything else - getting an overall score of 200. We all enjoyed this ride. DH and I agreed that we'd forgotten how good it was. 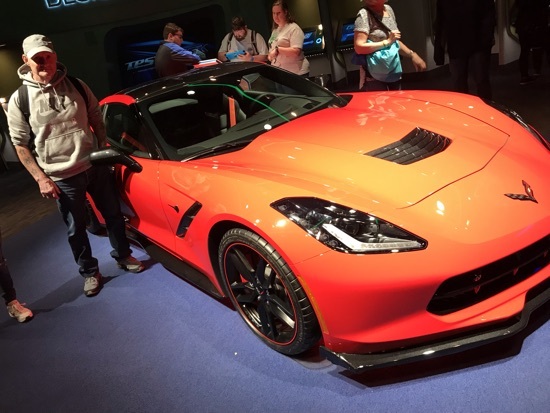 DH spent some time admiring the cars in the show room - he was particularly impressed with this one! 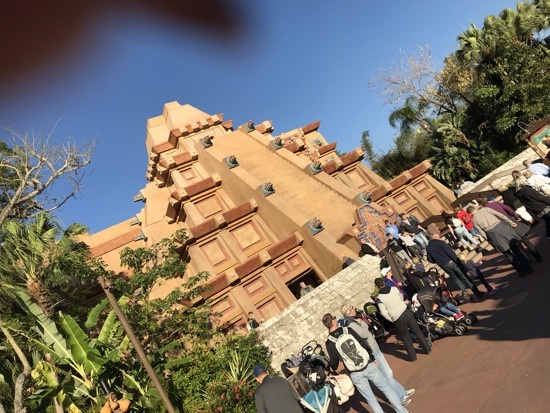 Our final FP wasn't until 7pm so we resumed our tour of World Showcase - starting in Mexico. We didn't bother riding 3 Caballeros. The queue snaked around the whole building and we couldn't even get close enough to see the wait time. We do like it - but not enough for this! So we moved on to Norway. 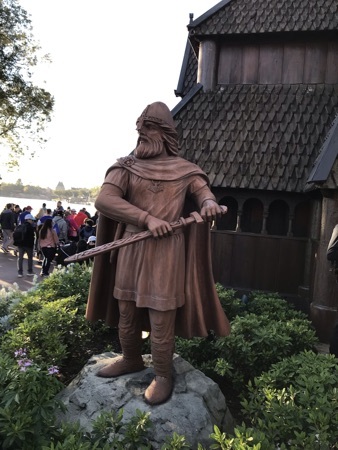 DH is fascinated by the Vikings - I don't know if anyone has noticed this from his tattoos - so he enjoyed looking at the exhibits and reading the information about the Norse gods. Unfortunately Frozen was still a no go with a wait time of 95 minutes. Next stop was China - for a sit down as much as anything! 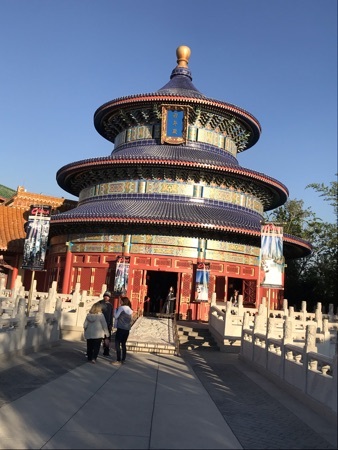 The buildings here are probably my favourite out of all the World Showcase Pavillions however, the inside is just like one huge advert for Shanghai Disney! 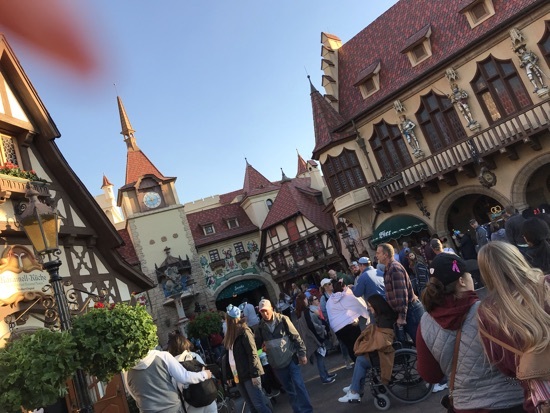 We carried on round the lake to Germany - a country that DH says that he would like to visit in real life, so it will probably figure in future travel plans. 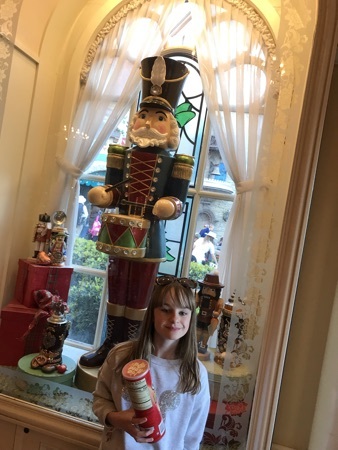 DD loved the Christmas decorations here. Not for the first time this holiday I was blown away by the prices! 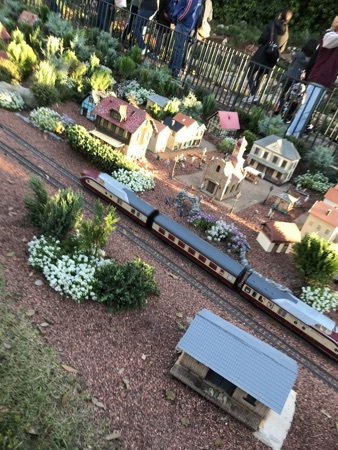 We stopped to watch the miniature railway for a while before eventually arriving outside The American Adventure - just as a show was about to start. We had never bothered watching this before but felt that as America is the host nation and it is a celebration of their history we really should! As expected it was a very sanitised and patriotic version of events. I was glad that I'd finally seen it but don't think that I'd bother again. It was getting dark by now and even in her sweatshirt and jeans DD was getting cold (we'd now seen several people coming into the park in coats, hats and gloves!) so we stopped at Mousegear and bought her a blanket to wrap round her. This cost $49.99 - the service in here was so slow that we thought we would never get out. The cashier was having problems with his till and then spending an eternity with each customer apologising for it! 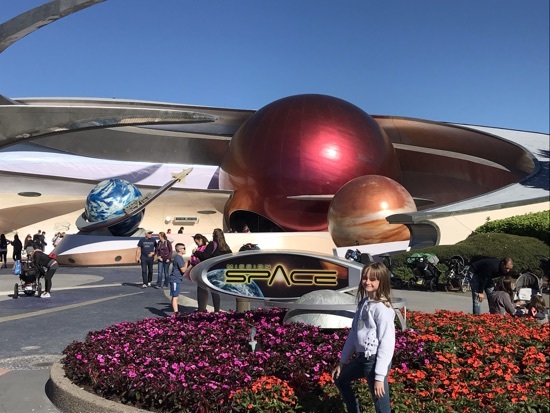 We only just made our last FP, on Spaceship Earth, we weren't too bothered about this one as we'd already ridden it last week. By the time we came off there were no more FPs left for anything. The fireworks weren't starting till 9 tonight so we still had a little bit of time to fill and decided on a final ride on Nemo which only had a 5 minute wait. 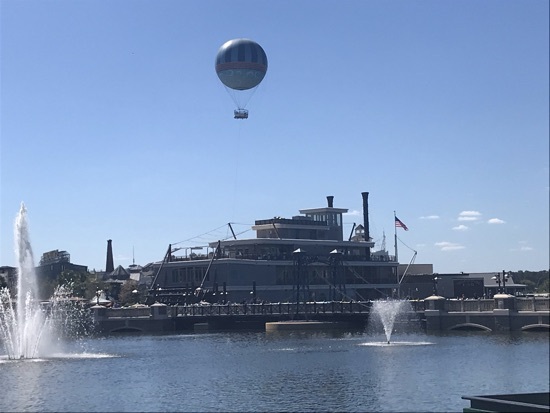 (We would all have preferred another go on Soarin' but with a wait time of 35 minutes this would've been pushing it to get back in time for Illuminations). 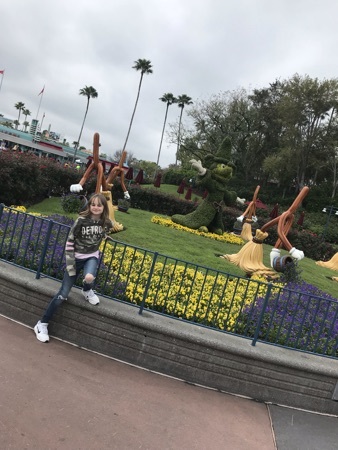 So our WDW adventure ended in exactly the same place that it had begun 2 weeks previously. After our ride we wandered back towards the lake and found a bench to sit on while we waited for the show to begin ... and DD promptly fell asleep! 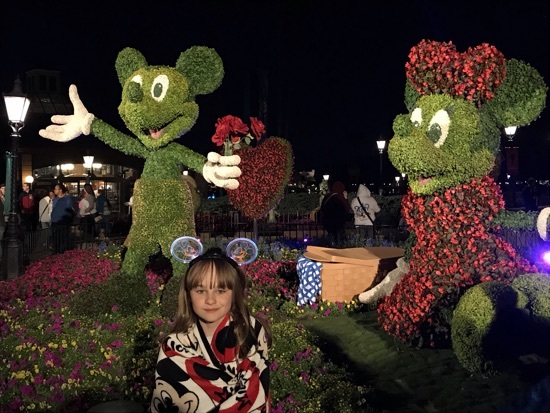 We decided that it was too cold to let her stay where she was and that if we woke her to watch the fireworks she would probably be too tired to enjoy the show anyway, so with just 20 minutes left to go, we reluctantly left the park and headed back to the Uber pick up point. Not quite the ending that we'd hoped for but for the most part we'd all had a good day. We woke this morning to the first bad weather of the holiday. Temperatures had plummeted to 12 degrees and it was chucking it down. The weather forecast suggested that this would continue until lunch time so I hastily re-arranged today's FPs to this afternoon. DH had relented slightly on his anti theme park stance and said that if the weather improved he would come with us for a few hours later on. We took our time getting up and ready today as there was now no rush to do anything. It was 10am before we were all showered and dressed. 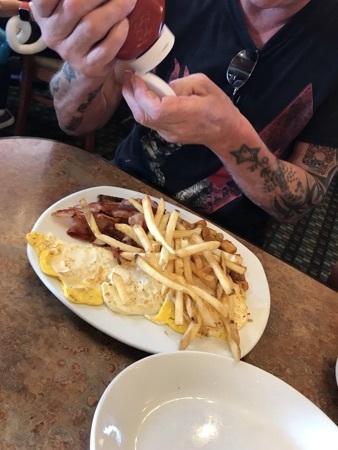 DH chose to go back to Golden Corral to eat as he still hadn't had a proper breakfast there and it was the closest option in view of the weather. 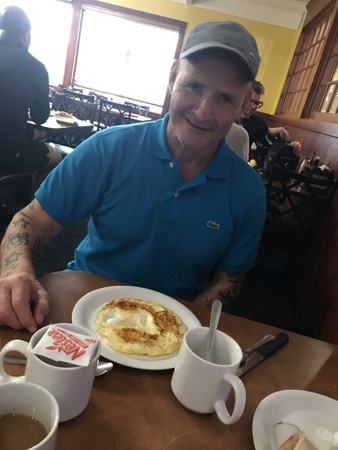 At last he managed to get a full cooked breakfast - although he was disappointed to find that they no longer appeared to have fried eggs. 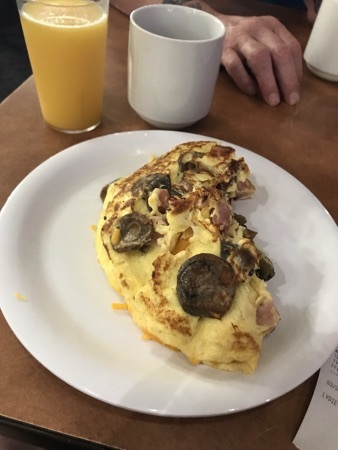 I had another omelette - ham and mushroom - which was very nice as usual. Whilst waiting for this to be cooked I realised that the reason for the lack of fried eggs on the buffet is that they now cook these to order too. So DH finally got his plate of fried eggs, cooked exactly to his liking (ie. solid!). He'd also managed to get a cup of tea rather than coffee with his breakfast so he couldn't have been happier. 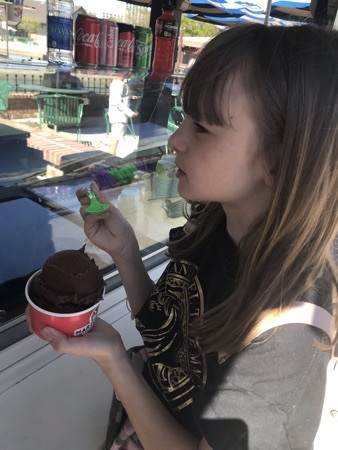 DD had her usual coco pops followed by ice-cream. Successful breakfast all round. We popped over to Walgreens for some supplies and also picked up an umbrella as there was no let up in the rain. 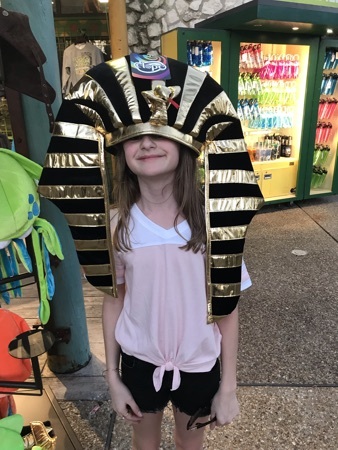 At this point I was beginning to wish that we'd not used the Sealife / Madame Tussaud's tickets so early in the holiday and had something left to do indoors. We ended up returning to the hotel room and just chilling for a few hours as there was no pleasure in wandering round in the rain. By 1pm the rain had almost stopped and DD was getting really bored. Our first fast pass window was opening at 1.35 so a decision had to be made. Despite earlier promises, DH said that he didn't want to go if there was any chance of rain (he's a window cleaner so doesn't go out in the rain!). DD and I set off without him for a 3rd day. 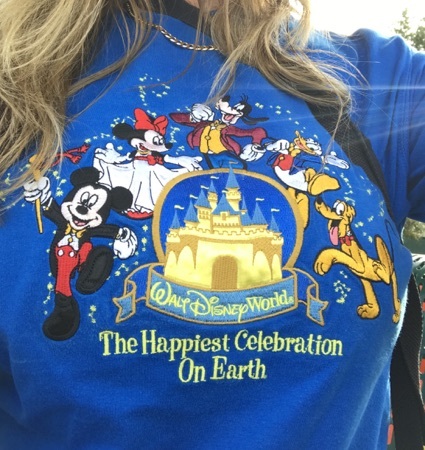 I donned my Happiest Celebration t-shirt which was another souvenir from a previous trip that had never seen the light of day at home. At this precise moment the slogan was starting to feel a bit ironic! 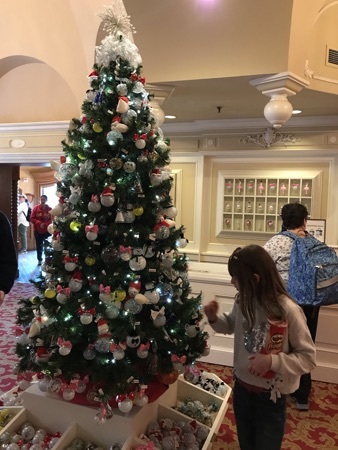 We got an Uber from the hotel (which due to a 30% discount only cost $12.10) but whilst in the car I got a text from Disney saying that an alteration had been made to our first FP - it appeared that ToT was out of action so they had instead issued us with a FP that could be used on a choice of several different rides (although unfortunately NOT Slinky Dog!). 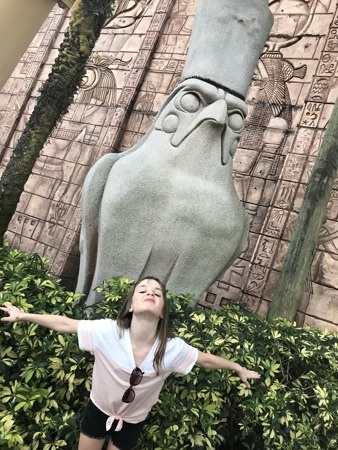 DD was disappointed as prior to the holiday ToT was the one thing that she'd seen in the WDW ads that she really wanted to do. 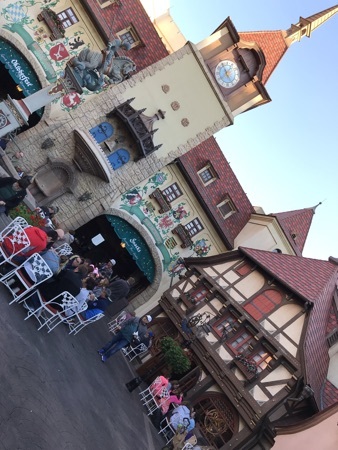 I was just confused as ToT was actually on the list of attractions that we could use our new FP for. I told DD that hopefully this meant that they were hoping to get it fixed at some point that day and promised that we would check out exactly what was happening before wasting the FP on anything else. 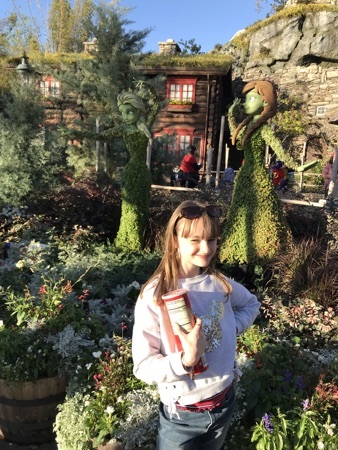 By the time that we reached the Tower it was up and running again = one happy little girl! I was glad that we still had our FPs as the closure meant that the standby queue was at 120 minutes! 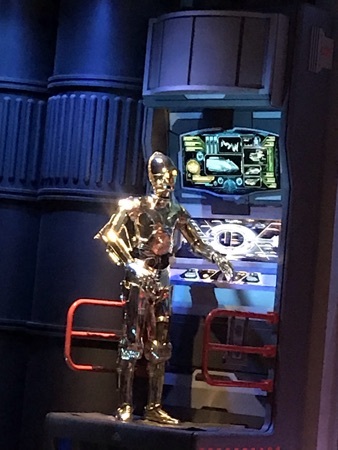 Our second FP, for Toy Story Mania, didn't open till 2.50 so we had time first for a ride on Star Tours which only had a 30 minute wait. We both enjoyed this. I'm sure that the new Star Wars Land will be amazing when it opens but this area of the park is currently looking very bare and uninviting due to all the boarding. 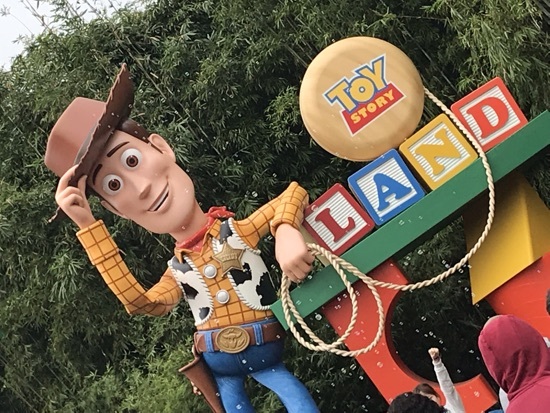 The theming of Toy Story Land is amazing with all the larger than life characters and icons. 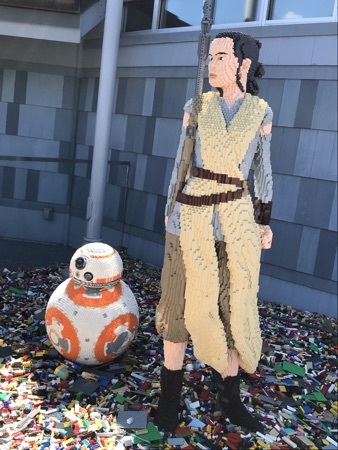 I was very impressed with how it's been put together. DD loved the monopoly board on the ceiling of Andy's room - Monopoly is her favourite game. There is almost so much to see and do in the queuing area at TSM that it's a shame to be in the FP line! 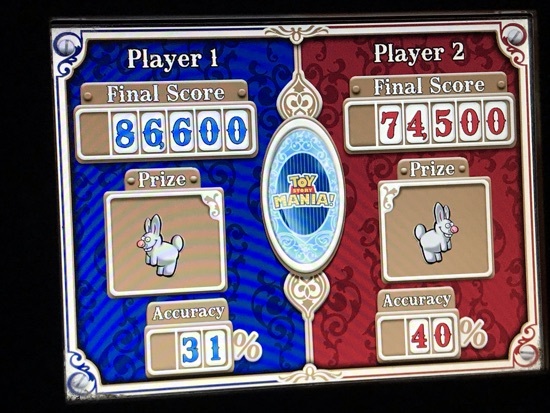 Without DH, who's really good at shooting games, to show us how it's done, our scores weren't brilliant. It was pretty close all the way through but DD eventually won! Slinky Dog looks absolutely amazing but with a wait time of over 2 hours there was no way that we were queuing for it. We checked out Alien Swirling Saucers but even these had a wait time of 55 minutes and it's essentially just another tea-cup ride so we didn't bother. Hopefully the opening of Star Wars will take some pressure off this area of the park and make the rides more accessible to those without FPs. 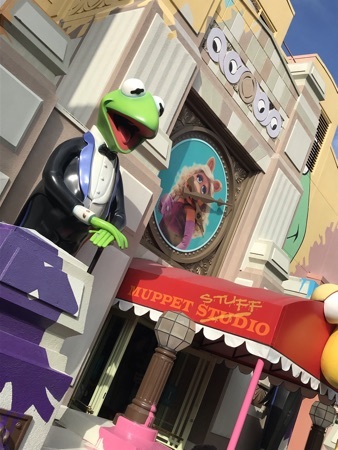 Our next stop was Muppets 3D. I know this show virtually word for word but it still makes me laugh. DD who didn't remember seeing it before, found it hilarious. 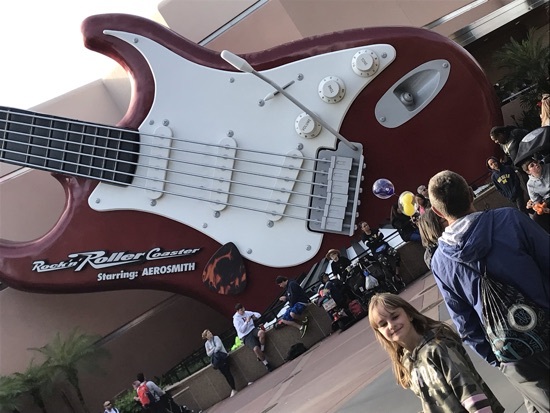 Our final FP was for Rock n Roller coaster. 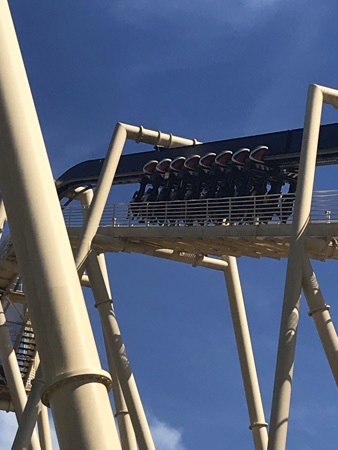 I love this ride but wish that it went on for longer. 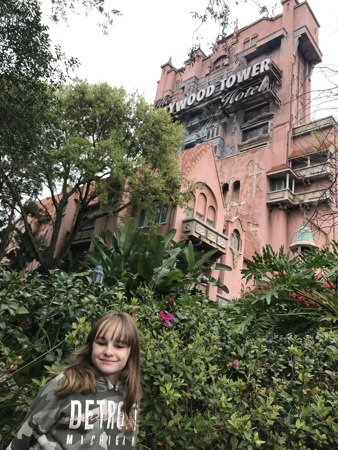 DD was quite blasé about it after some of the coasters that she's ridden in the last few days! I really wanted to watch the Beauty and the Beast show so was disappointed to find that there wasn't one today. It was only 5pm and we'd been here for less than 4hrs but had pretty much done everything that we wanted to. We considered waiting for Fantasmic but this is my least favourite of the evening shows at Disney and it still wasn't very warm so there didn't seem much point in hanging around for it. I found it quite sad that so many of the rides and attractions here are currently closed, hopefully the new ones will breathe life back into the place when they open. At the moment, even in good weather, I don't think that it would be a full day park. 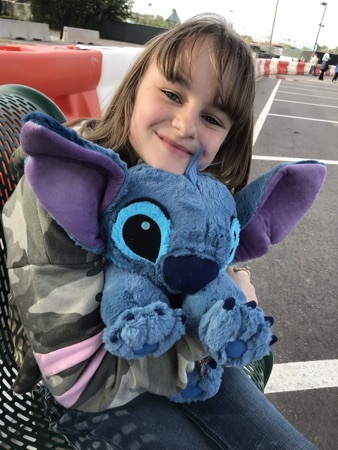 On the way out DD bought herself a Stitch cuddly and pin. The cuddly was $27.99 and the pin $12.99. 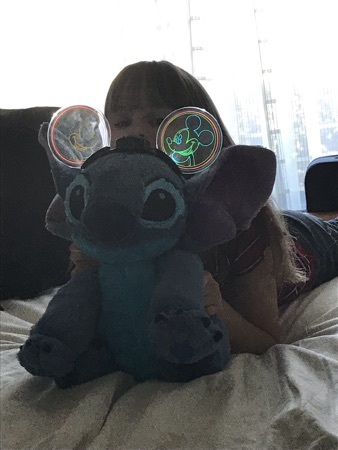 She's had her eye on these for most of the holiday and Stitch replaced the owls in bed tonight. When we returned to the hotel DD was hungry so we grabbed her some chicken nuggets and fries from McDonalds. Neither DH nor I wanted anything to eat. I'm not sure whether it's the change in diet or the weather but we're both finding that we can't eat more than one proper meal per day. This evening we went swimming. This might seem mad given the weather conditions today but the water was lovely and warm. It felt like being in a jacuzzi and there were actually more people in the pool tonight than we'd seen all holiday. DD managed to swim 2 lengths without stopping! 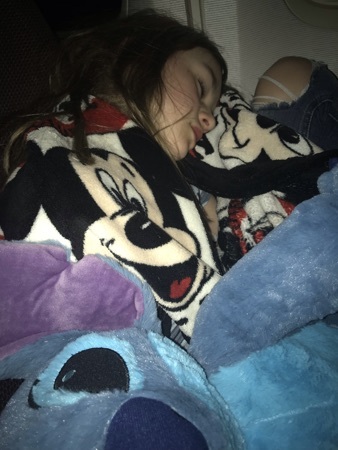 She watched Spy Kids 4 on Netflix and was asleep by 9.30 pm. DH and I relaxed with a drink and watched a few episodes of American Chopper. We used to enjoy watching this back in the U.K. but no longer have Sky at home. 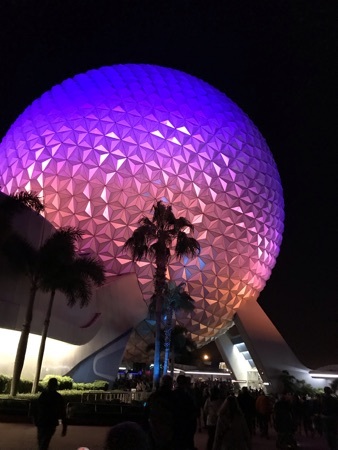 Tomorrow is our last full day and it will be a late start and back to Epcot for Illuminations. This is DH's favourite park and favourite firework show so he's agreed to come with us and hopefully end the holiday on a high! 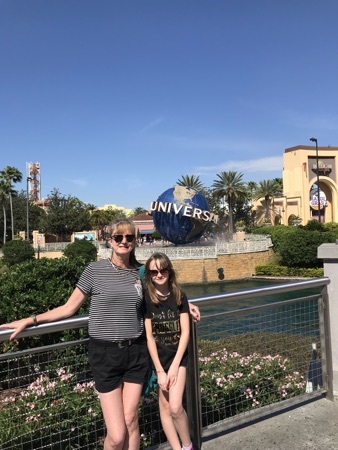 Today had always been scheduled as our 2nd day at Universal / IoA. However after our less than successful visit on Saturday, DH was reluctant to return. 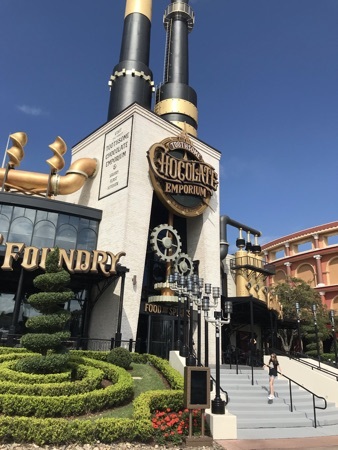 We discussed various ways of altering the itinerary and swapping one of our remaining Disney days to today but couldn't get the FPs that we wanted at such short notice. With only 3 full days left we had little room for manoeuvre. He told me to just go ahead as planned; take DD and leave him at the hotel but I was reluctant to do this for a 2nd day running. It felt like he'd given up on the holiday and that we were abandoning him. However he wasn't prepared to give it another go and said that he actually preferred relaxing at the hotel. I, on the other hand, wasn't prepared to waste the tickets in favour of a day sitting around doing nothing. So off we went again without him. As we hadn't booked the transfer bus the night before we got an Uber to the park, which cost just $5.61, and arrived just after opening. I hoped that this time we would be ahead of most of the crowds. 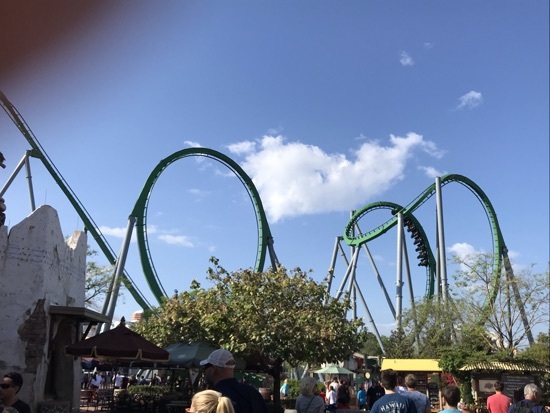 When we reached the Hulk and the posted wait time was just 15 minutes it seemed like the plan was working. We waited in the queue... and waited... and waited. 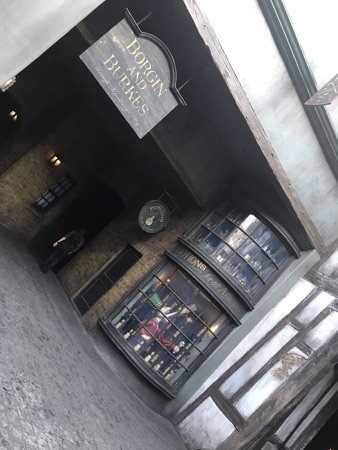 After about half an hour we were eventually inside the lab and the reason for the delay became clear... a seemingly endless stream of guests with front of the line passes meant that the standby queue was hardly moving. The 15 minutes turned into more like 50. But this ride was so worth the wait. I'd forgotten how good it is and DD loved it! We decided that we might as well have a go on Storm Force Acceleration which was right next to us and had a 5 minute wait. This was fun, although basically just a re-theming of a tea cup ride. DD enjoyed making the car spin and hoped to make me dizzy as she'd done to her Dad in MK during our 2012 trip... it didn't work! 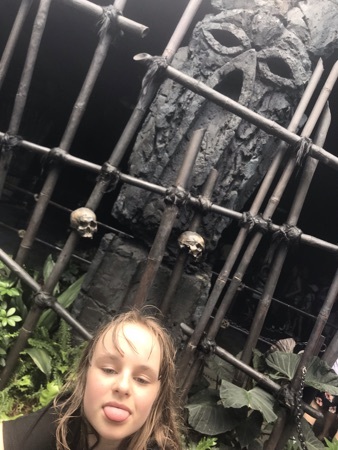 DD flatly refused to attempt Dr Doom’s Fear Fall after her experience of Falcon’s Fury yesterday! By now we were feeling hungry having had no breakfast before we left the hotel. DD had spotted Toothsome when we were here on Saturday and I'd been telling her about their massive milk shakes. She asked if we could have one for breakfast. I thought, we're on holiday, why not? We were seated at an outside table. 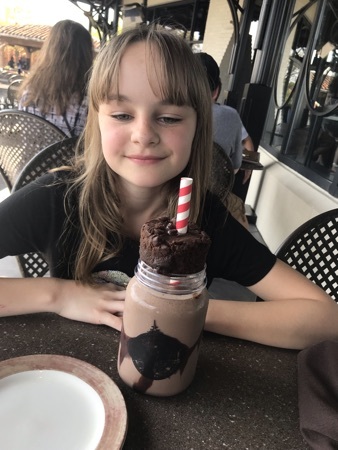 DD ordered the Brownie - chocolate ice-cream with milk chocolate swirls, topped with a brownie. 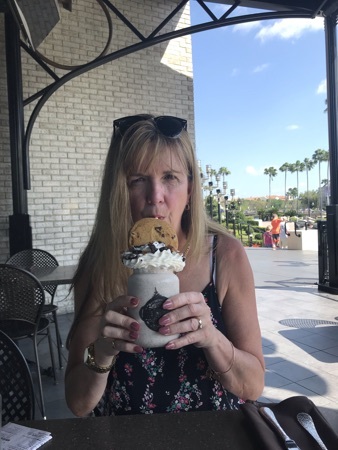 I had the Cookie Jar - vanilla ice-cream, with Oreos, oatmeal and a chocolate chip cookie, topped with whipped cream. These were huge and very sickly! We enjoyed them but DD didn't manage to finish hers and we definitely couldn't have eaten a meal with them. At $13 each (+ tip) they were a bit of an extravagance but we did get to keep the souvenir jars which our server kindly rinsed out for us. Returning to the park our next stop was Spiderman. This had a 40 minute wait but it passed quickly and we were soon enjoying the ride. Another great simulator from Universal. 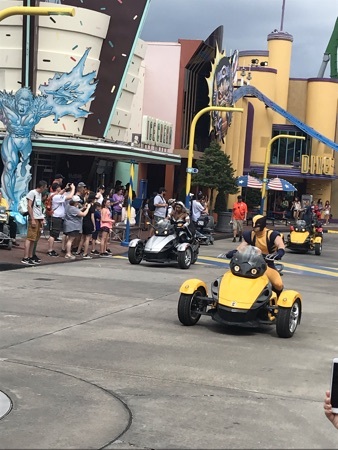 We came out just in time to see the Marvel Super Heroes motor bike procession. As soon as the bikes were gone we continued our way round the park heading into Toon Lagoon. 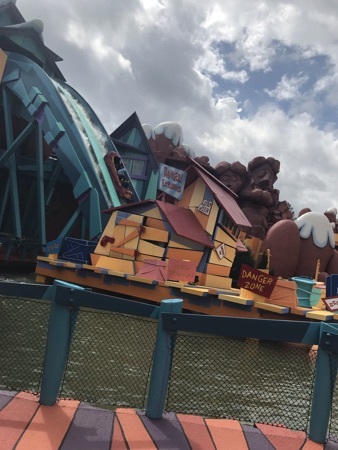 Bilge Rat Barges was closed for maintenance so we joined the queue for Dudley Do-Right's Ripsaw Falls. 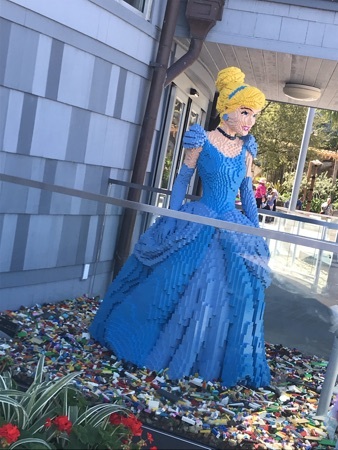 This was posted as a 60 minute wait. This has to be one of the most boring queuing areas that I've ever experienced. It is dark, cramped and moves so slowly; it felt like we were never going to reach the end. It was actually the first time that I'd ever done this ride. Water rides are amongst the few that DH enjoys so on previous visits he's taken the older children on while I've occupied the little ones. 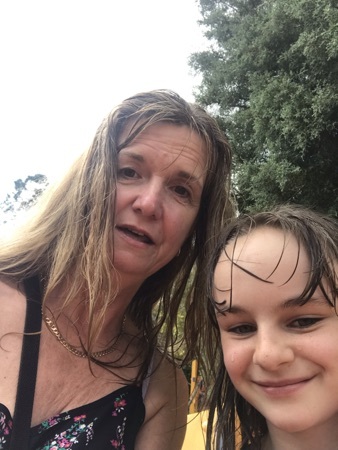 It is definitely the wettest water ride that we've tried anywhere this holiday - we got soaked! 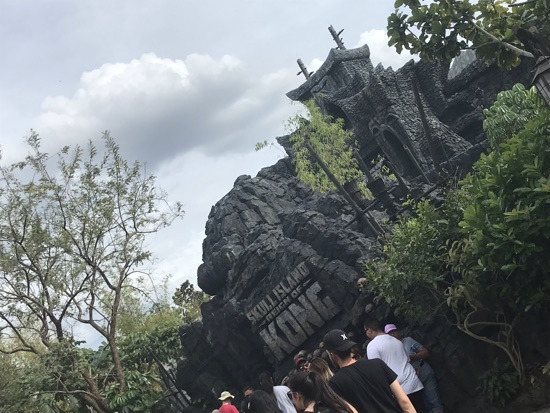 Our next stop was at Skull Island: Reign of Kong. This was a new one for both of us and was also posted as a 60 minute wait. However in contrast to Ripsaw Falls there is lots going on in the queuing area and the time passed quickly. There are a few surprises which I won’t go into here as I don’t want to spoil it for anyone yet to experience this ride. Unfortunately, for me, the ride didn't quite live up to the build up. It wasn't bad, there just seemed to be something missing. It is yet another simulator and I think that they could've done more with it. 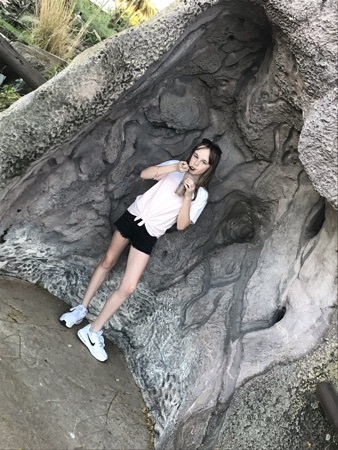 We headed into Jurassic Park and rode the River Adventure - and I got wet again! DD was in the middle of the boat and managed to avoid it. 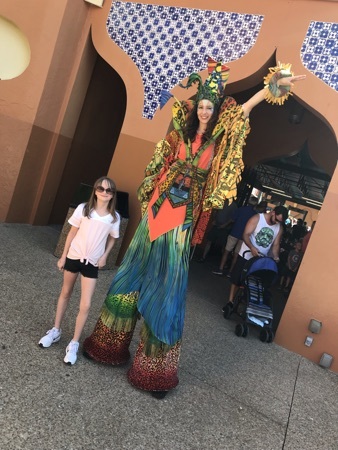 DD then wanted to try the Pteranodon Flyers which was showing a 55 min wait - I questioned whether it was really worth it, especially when she had to prove that she was under 56 inches tall before we were even allowed to join the queue. 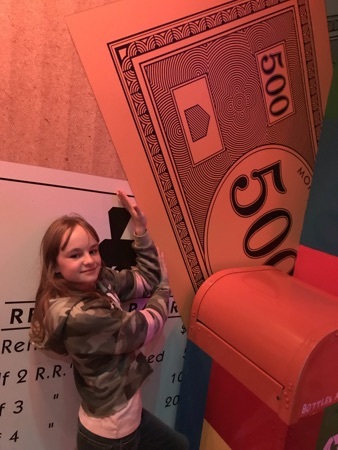 (We've spent most of the last few days proving that she is OVER 54 inches so that she can ride the roller coasters!) However she was determined that she wanted to have a go. We'd been waiting for about 10 minutes when they announced that they were closing the ride due to technical problems. We decided to stop and get something to eat from Pizza Predattoria. 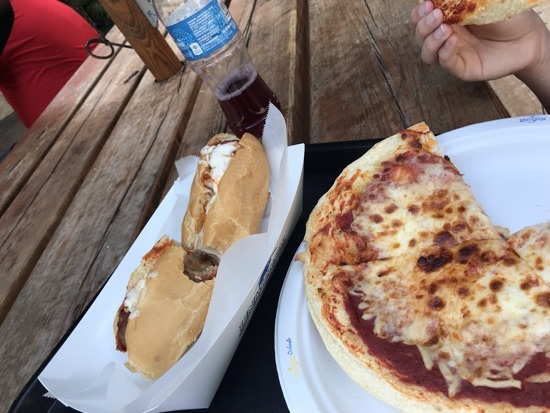 I had the meatball sub and DD had a cheese pizza. 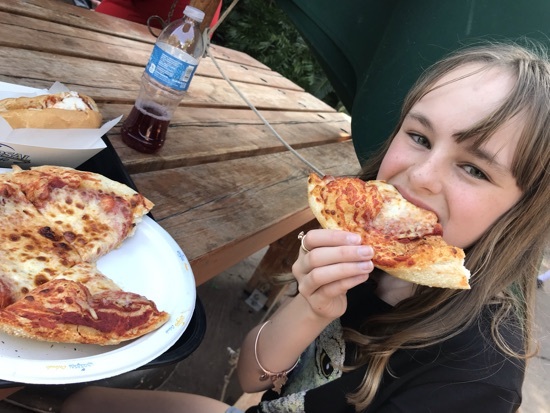 These were very tasty and DD declared it the best pizza of the holiday. 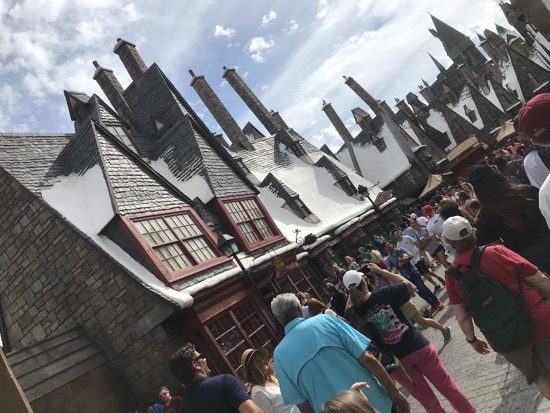 We had now arrived in Hogsmeade which was considerably less crowded than it had been on Saturday. 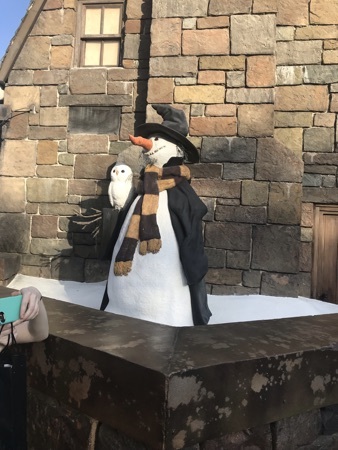 I managed to get some photos before entering the castle for a ride on Forbidden Journey. This was another 60 minute wait. Again it passed relatively quickly due to all that is going on. 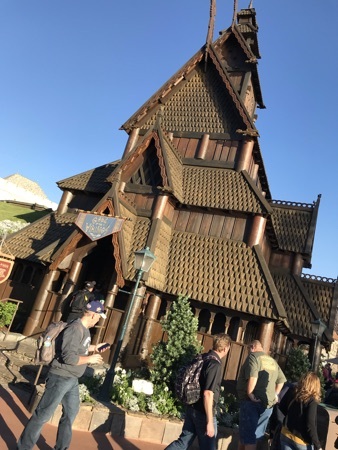 It was nice to see this properly because although we'd done the ride in 2012 it had been a walk on then so we'd rushed through the castle and not taken in much of the detail. We both loved the ride. DD would have done it again but there just wasn't enough time. 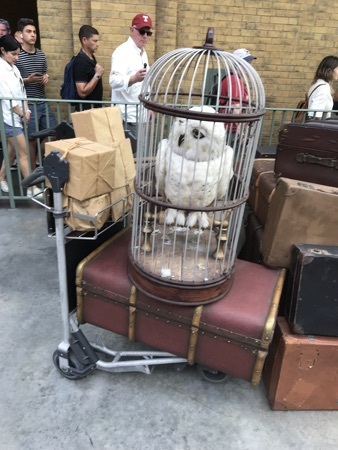 Whilst we were here we also rode Flight of the Hippogriff before heading to the station and taking the Hogwarts Express over to Universal Studios. 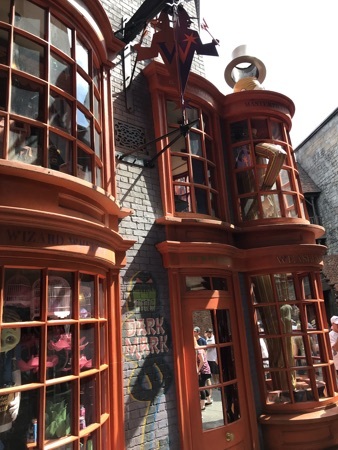 We finally managed to get a proper look round Diagon Alley. It didn't disappoint. 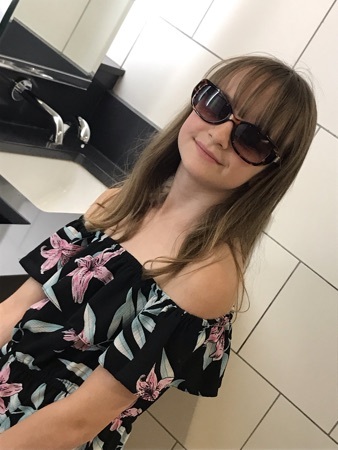 I took loads and loads of pics to share with the girls back home, who I'm sure will want to know all about it... but I won’t bore you here with any more of them! 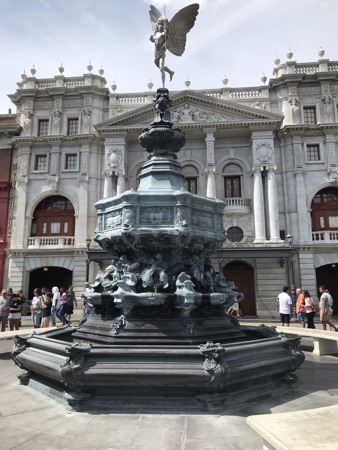 We then joined a 50 minute queue to ride Escape from Gringotts for a second time - this time making sure that I had my phone with me to take some pics. Again it was brilliant. It was 6.20pm by the time that we left this ride. 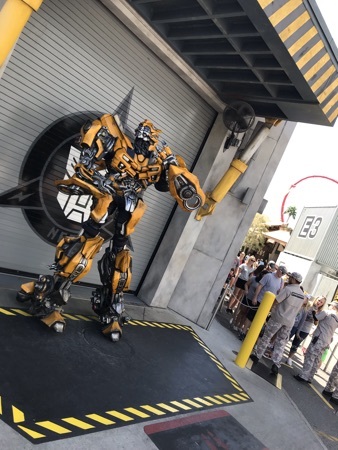 The park was due to close at 7 and we hoped that we'd have time for one last ride, possibly on either Simpson’s or Minions both of which we’d missed on Saturday due to the crowd levels, but the staff were already clearing the park and ushering people toward the exit. We were disappointed to find that all ride queues had now been closed. We had no option but to join the mob heading for the exit. 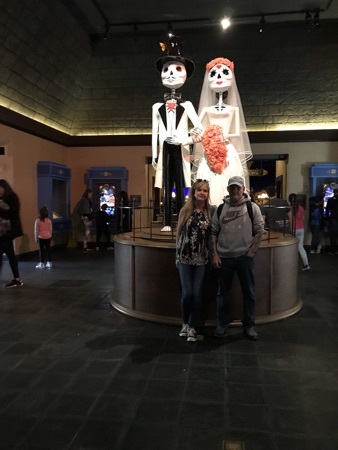 We wandered slowly through City Walk taking in all the sites and sounds. We debated stopping at Panda Express and taking a Chinese back for DH but he wasn’t answering the phone and I didn’t know whether he’d already eaten or would want to go out to eat when we got back so I didn’t bother. It took a while to get an Uber and when it arrived we had trouble finding him due to the shear number of people and vehicles trying to get out. After a couple of phone calls we managed to locate him. We arrived back at the hotel for 7.30 and DH said that he'd had another good day in splendid isolation and didn’t want to go anywhere this evening. 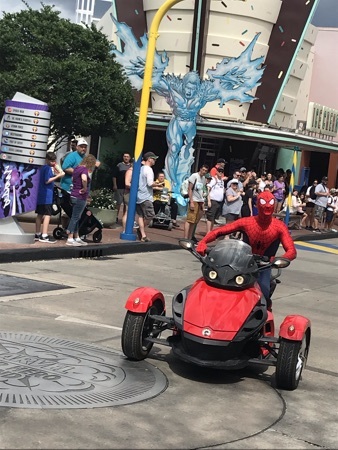 Tomorrow is supposed to be Hollywood Studios but DH is now saying that he never wants to set foot in another theme park ever again so we'll have to see what the morning brings! 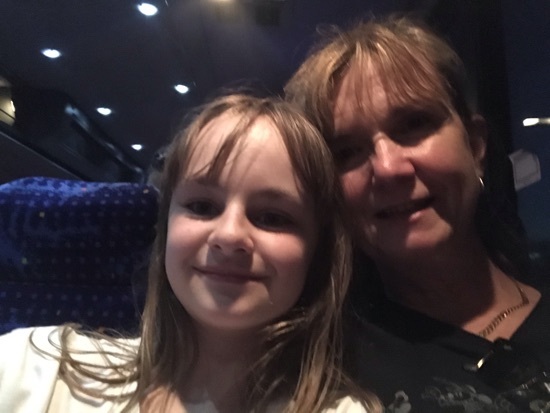 DD and I were going to Busch Gardens today on the Mears shuttle that picks up from Icon 360 at 8.45am. As we are now fully adjusted to Florida time I set my alarm for 6 to ensure that I would be up, showered and dressed in plenty of time. I had to wake DD up at 7. After making sure that DH was supplied with enough drinks and snacks to keep him going for a while we set off and left him to his lazy day of YouTube and Netflix. - and plain sausage for DD. It was a really pleasant walk up I-Drive in the early morning sun. We could already tell that the weather today was going to be beautiful. We were soon at the Icon 360. I was unsure exactly where the shuttle bus pick up point was located. The booking confirmation just said in the Parking Lot. I'd tried to get more specific instructions online but received contradictory advice, with some people saying that it was to the left of the multi storey car park as you approach whilst others were suggesting that it was at the back of the Eye near the Legoland bus stop. 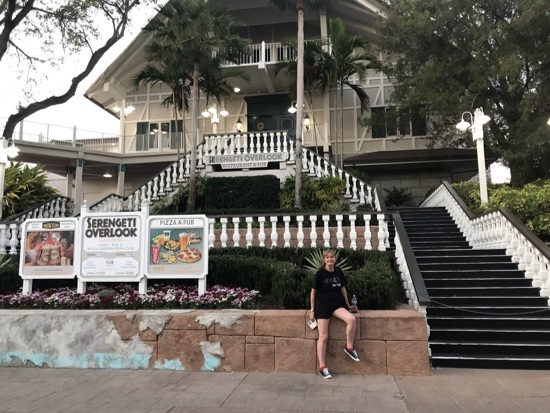 There was already a group of people waiting near the multi storey when we arrived so we asked them if they were going to Busch Gardens. They said that they were but that they weren't sure if they were in the right place either! There were absolutely no signs anywhere. 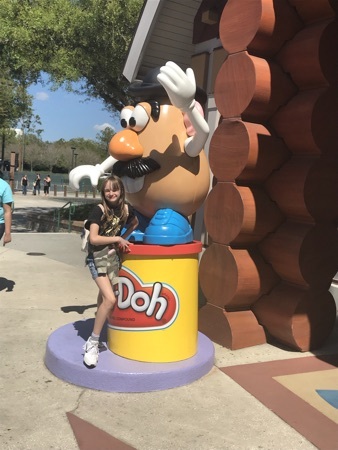 As we still had plenty of time DD and I wandered round to the back of the Eye to check out the other possible stop... only to find a crowd of people here too, standing at the Legoland bus stop already discussing whether this was the right stop for Busch Gardens. At this point an employee, who must have overheard the conversation, came over and said that we did all in fact need to wait round the other side, back where we'd just come from! Once we'd sorted out where we needed to be the bus arrived promptly and we set off on time. Thankfully, after yesterday, these buses are clean, comfortably and have air con. They even have TV screens playing a movie - we watched The Lost Medallion - this helped to occupy some of the journey. We made a stop at Seaworld to pick up more passengers but the coach was still only about half full. 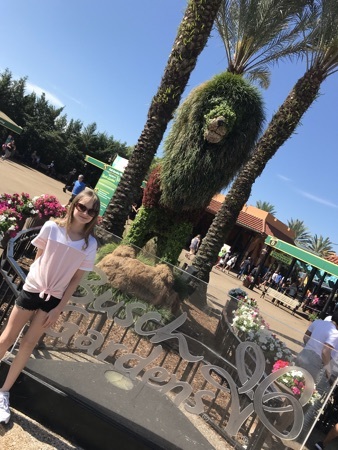 After an uneventful drive we arrived at Busch Gardens just after 10.30. The driver explained that he would pick us back up tonight at 7pm at stop 24 where he dropped us off. He warned that we should be there 15 minutes early as they wouldn't wait for late comers. This was significantly later than we'd expected. Friends who'd been previously had mentioned a return pick up of 5.45. I text DH to let him know that we'd be back later than we'd thought. As we'd never previously visited this park we stopped at guest services to pick up a map, where we encountered these stilt walkers. 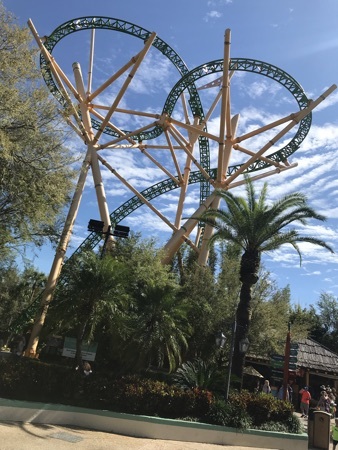 Our main purpose in coming here was to ride the big coasters, the closest of these to the entrance is Cheetah Hunt so we decided that this would be as good a place to start as any. 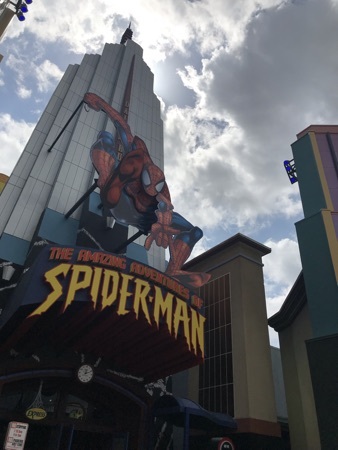 We stopped to admire the ride's namesake. The posted wait time was 45 minutes, which after yesterday didn't seem too bad so we joined the queue. What a brilliant start to the day! 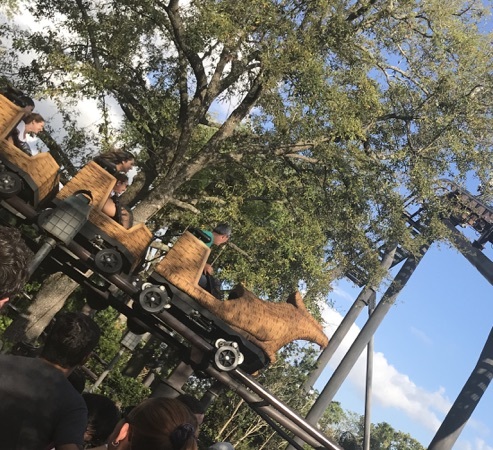 This ride is very fast and we loved it. 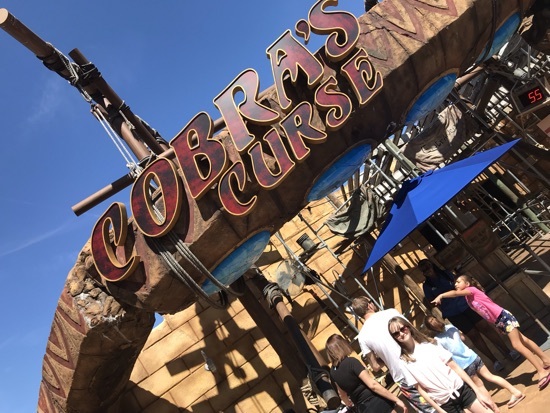 Next stop was Cobra's Curse. This had a wait time of 55mins. 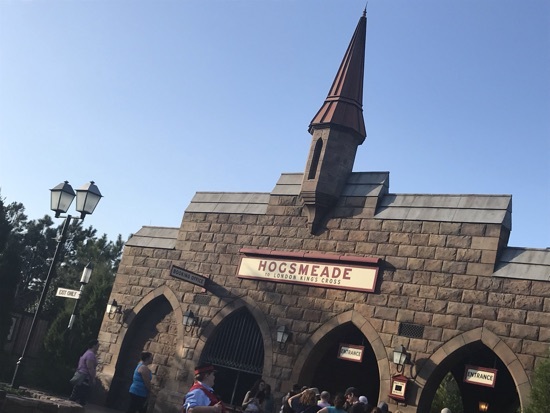 Although there didn't seem to be anywhere near as many people around as we'd encountered in Universal, I was beginning to think that queues of around an hour per ride were just what we had to expect. At least today we weren't keeping DH hanging around waiting every time we wanted to go on something. By the time we came off Cobra it was almost 12 and DD said that she was hungry. DH had answered my earlier text saying that we'd be back too late to eat so he'd sort himself out and we might as well get a meal while we were at the park. 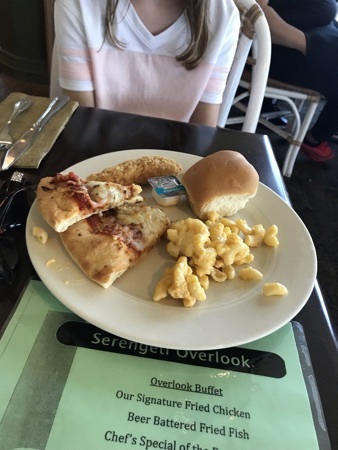 We'd passed the Serengeti Overlook on the way to the rides and DD had commented that the pizza on the poster looked good so I thought that it would be as good a place as any to try. 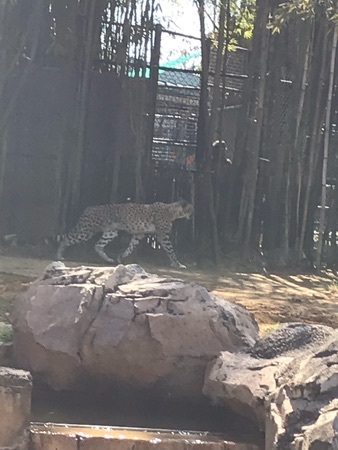 We retrieved my bag from the locker (I'd earlier paid $6 for a day pass which enables you to move your belongings from one ride locker to another for the entire day) and headed upstairs to the buffet restaurant which, as the name suggests, looks straight out onto the safari. We were told at the desk that there would be a 10 minute wait for a table but we were called through and seated very quickly. 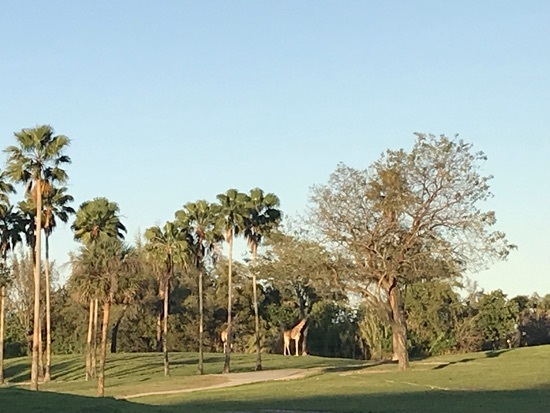 We could see lots of zebras and giraffes but as they were quite far away in the distance and our table wasn't right by the window I couldn't get any good pictures. This is a buffet restaurant and the food is typical buffet fare. 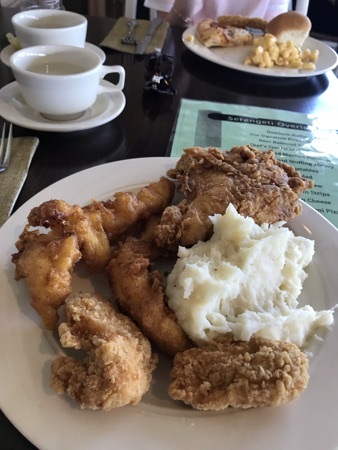 I had chicken strips, fried chicken and battered cod strips with seasoned mashed potato. It was all very tasty. DD had mac n cheese, pizza, a chicken strip and a bread roll. 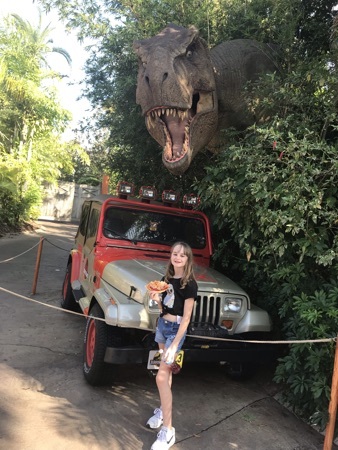 Neither of us had a second plateful as I was worried that if we over ate it might return to haunt us on the rides later! For dessert I had the strawberry cheesecake and DD had the chocolate gateau. 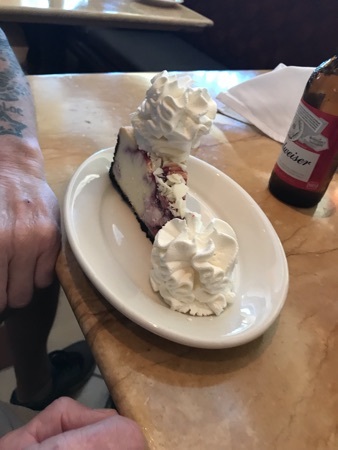 These were nice enough but didn't live up to the ones that we'd had at the Cheesecake Factory the other day. The portions were nowhere near as large either (thankfully!). This meal should have cost $19.99 each but when they brought out the check they'd only charged the Under 9's price of $9.99 for DD. I didn't feel guilty about this because I hadn't done anything to mislead them, no-one had even asked how old she was. I paid the bill and left a 20% tip. ... back to the rides! 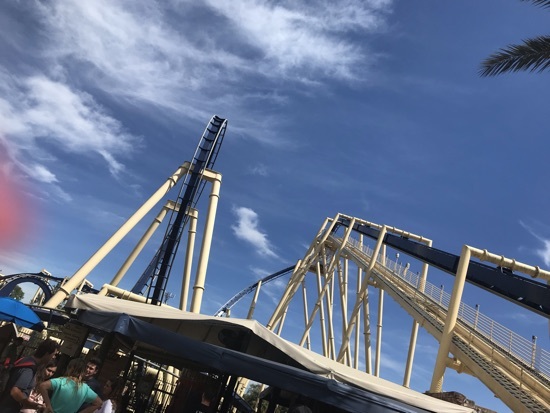 Our next stop was Montu which much to our surprise and delight only had a 15 minute wait - I think that our stop for lunch must have allowed that early morning crowds to get ahead of us. DD declared this her favourite coaster anywhere so far ... and we went straight back for a 2nd go. 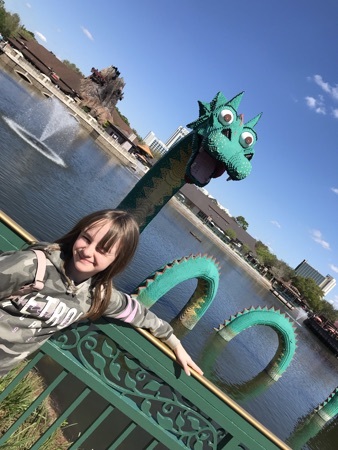 After this we joined the queue for the Skyride with the intention of crossing to the other side of the park and riding Sheikra. Unfortunately, after we'd been queuing for about 10 minutes, they put out an announcement that, due to high winds in the area, they were closing the Skyride. We toyed with the idea of using the steam train instead but everyone seemed to have had the same idea and the whole line was heading in the direction of the station. 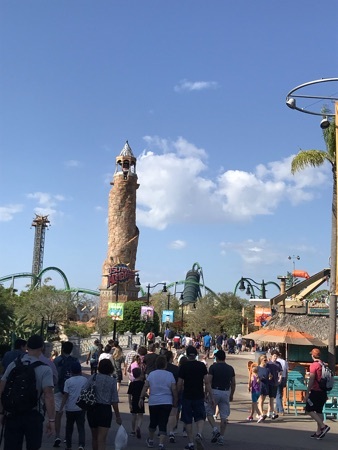 We set off to walk to Sheikra. 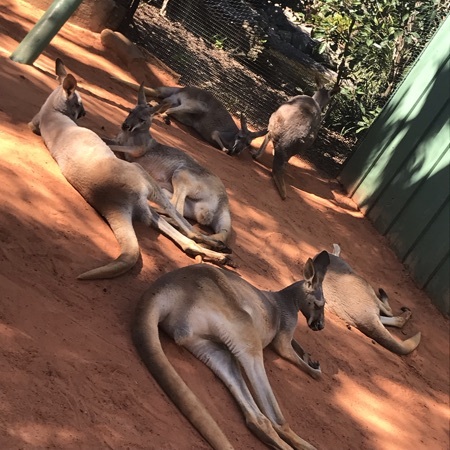 We stopped en route at the Kangaroo feeding station but they were all lazing in the sun and weren't interested in eating. 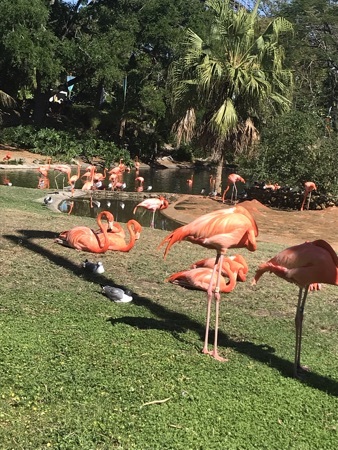 We also stopped to look at the Flamingoes. 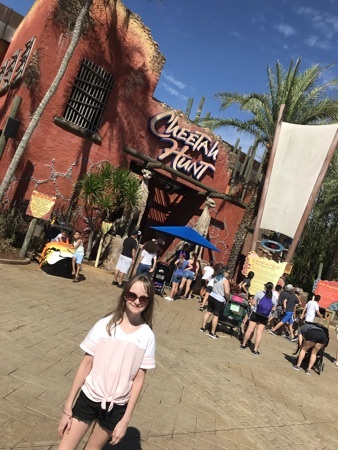 It felt like we'd been walking for ages but when we finally got to Sheikra the wait here was just 15 minutes too. DD loved it, particularly the massive drop over the edge! Again, we went straight back on for a second ride. 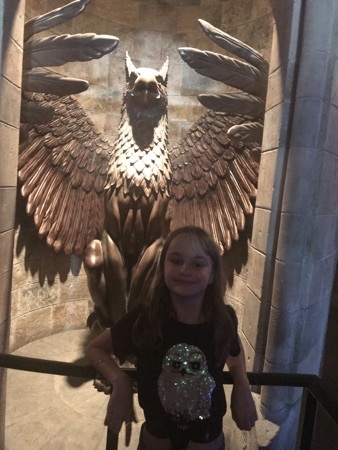 She actually wanted to try the front row but there were lots of people already queuing for this so we settled for row 2. Whilst we were in this area of the park we road The Stanley Falls Log Flume and Kumba, both with about 25 minute wait times. We enjoyed both of these rides but I forgot to take any photos. We checked out the wait time for Congo River Rapids but it was 60 minutes and as time was getting on we thought that we'd get more done if we skipped this one. 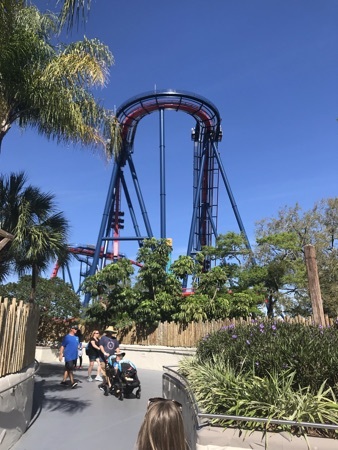 Whilst on Kumba DD had spotted Falcon's Fury and wanted to try it, so we headed off to the Pantopia area of the park. 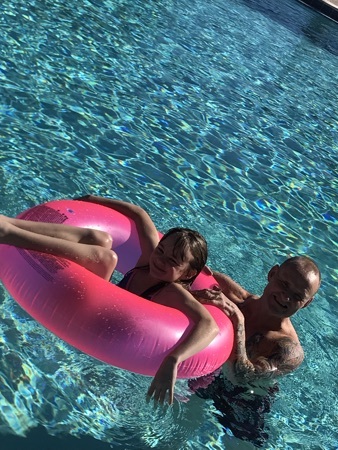 By now I felt that DD had no fear of anything - I was soon proved to be wrong! 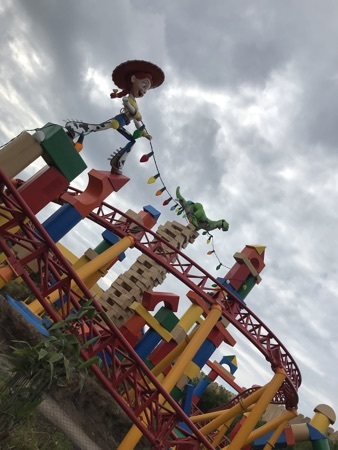 I thought that she knew what to expect from this ride but she hadn't noticed that it actually tips you face forward before hurtling back towards the ground. She was terrified! She was physically shaking when we got off. Still it didn't curb her enthusiasm for trying other things. As we were right next to Scorpion that was our next port of call. 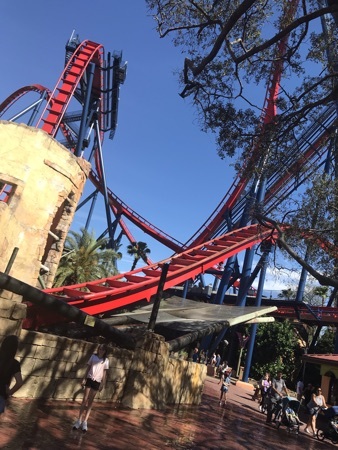 This is a much smaller coaster than most of the others at Busch and whilst standing in the queue (approx 15 mins) didn't seem particularly frightening. However, I found it to be the worst of the day. I don't know how old this ride is but it reminded me of the Coasters of my youth and felt quite shaky and jerky. DD didn't mind it but I felt quite unsafe! Just as an aside - my very first experience of a roller coaster was The Corkscrew at Alton Towers at the age of about 16. I hated it, kept my eyes closed for the entire ride and avoided all coasters for the next 15 years! 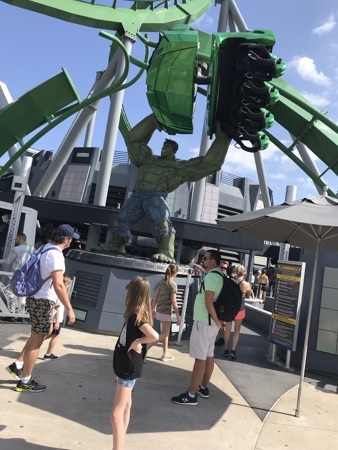 It was only when we visited Universal Orlando that DS30 managed to goad me into going on the Hulk with him and I've never looked back since. So the Scorpion didn't bring back good memories! We stopped at one of the ice cream stalls and bought a tub of brownie and cookie dough dipping dots to share. 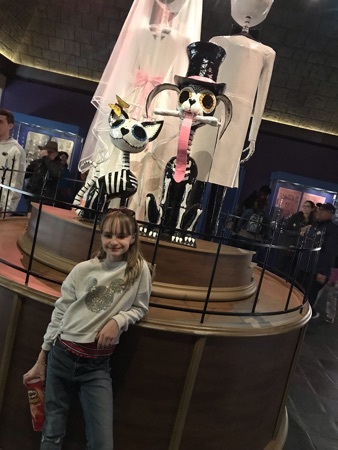 We now only had about 45 minutes left before we needed to meet our coach and we'd done most of the rides that we wanted to so I asked DD if there was anything that she'd like to do again. 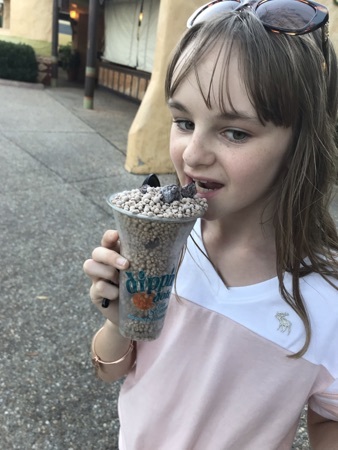 She asked for Montu and we wandered back in that direction enjoying our Dipping Dots and watching the animals. The wait was now down to 5 minutes and we managed to ride another 3 times before it was finally time to leave the park. 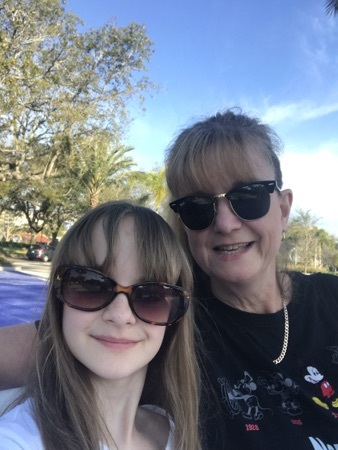 We'd both had a fantastic day and a real Mum & daughter bonding experience. DD was exhausted and slept for most of the journey back to Orlando. I watched Journey 2: The Mysterious Island. We were back at the Icon 360 for approx 8.30. We nipped into Walgreens on our way back to the hotel as DH had text me to say that we'd run out of coffee. When we got back we told him all about our day but I don't think that he was remotely envious - he'd enjoyed his time alone to relax! Today we were booked onto the 10.20 shuttle bus for Universal Studios. 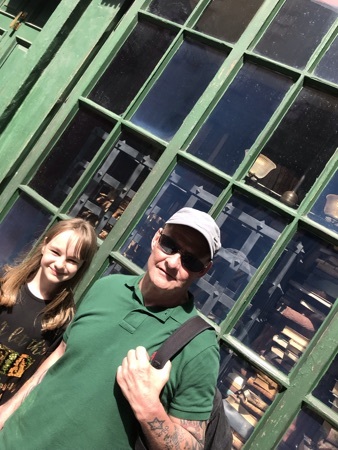 DD was looking forward to the opportunity to ride more big coasters, I was looking forward to seeing the new parts of The Wizarding World of Harry Potter. We both dressed appropriately for the occasion. 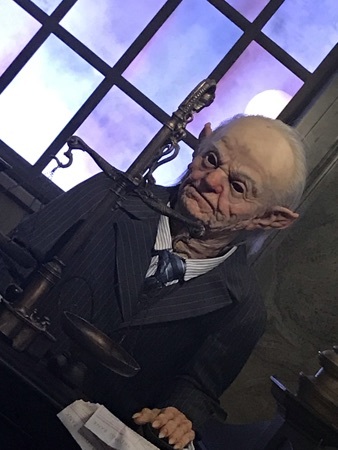 DH was more apprehensive about the rides at the Universal parks as a lot of the new attractions seem to rely heavily on simulators. 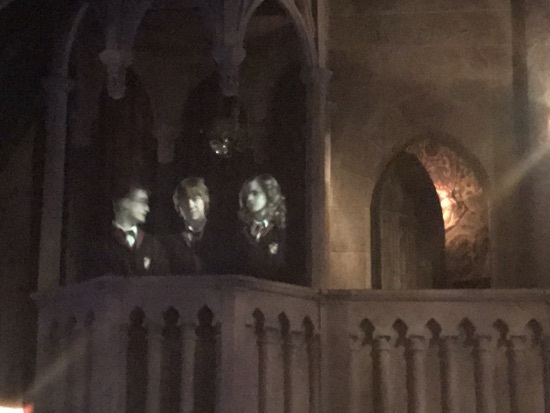 He tends to suffer from motion sickness and on our last visit Forbidden Journey made him feel really ill. This time he took 2 travel sickness tablets as a precaution before we set off. 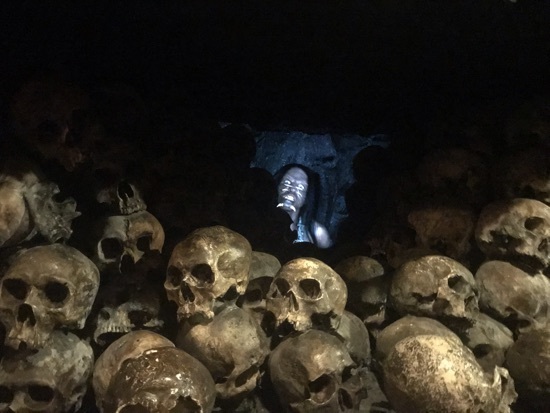 The shuttle bus arrived on time but we quickly remembered why we’d stopped using them during our previous holiday. They are uncomfortable, have no air conditioning and they cram way too many people on to them. All the seats were taken by the time that they'd boarded the passengers from our hotel but they still picked up at 2 more on the way. The normally 5 minute journey took half an hour and was thoroughly unpleasant; we could've walked there quicker! 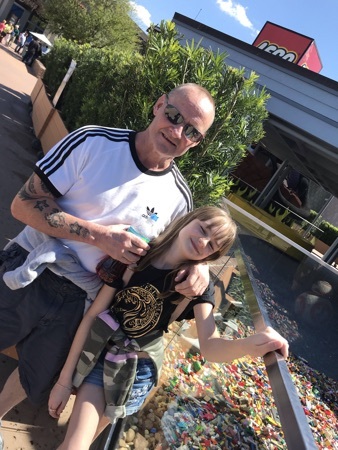 Not the best start to the day but it got us there in one piece and we were soon walking through City Walk and posing for photos by the Universal Globe. The sun was shining and the park was already getting very busy. The first ride that we came to was Minions but it already had a 60 min wait so we decided to skip this and went across to Shrek 4D instead, where the wait was only supposed to be 20 minutes. By the time we got into the show it was at least double this! Although we all enjoyed it we weren't sure that it justified the wait. 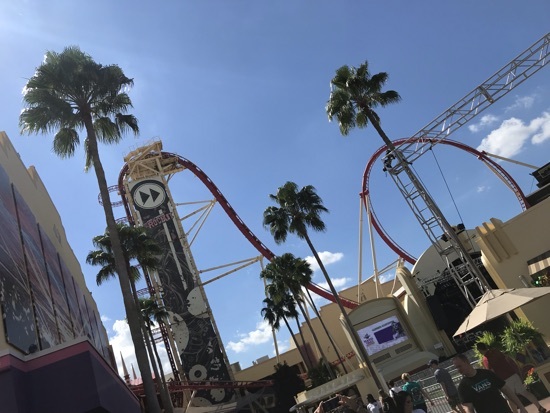 Next stop was Rip, Ride, Rockit. DD with her newly acquired coaster addiction was determined to ride this. It was my turn to be nervous! During our last visit this was the only coaster that I refused to ride. 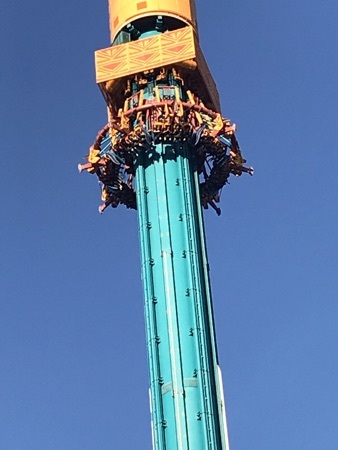 DD18 and I had stood watching it for ages before making our minds up but I really didn't like the thought of not having a full shoulder harness on a ride that goes upside down so we eventually decided not to bother. It was only after returning home that I learned that, despite appearances, it never truly takes you upside down. Anyway, I couldn't be beaten by an 11 year old so this time I had to be brave! I needn't have worried. By far the worst part of the ride is the steep climb to the top at the beginning. 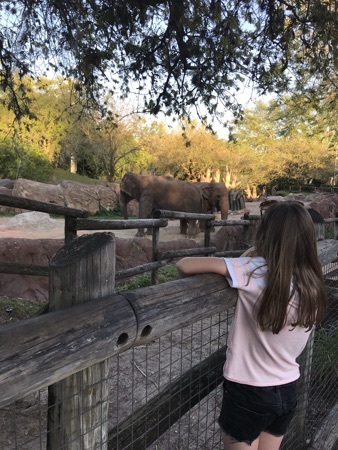 The rest felt quite tame compared to the ones we'd done at Seaworld and it was over very quickly. I chose ZZ Top as my accompanying music, DD left the machine to make a random selection and wasn't sure what she'd been listening to. Typically, she loved this ride and wanted another go but as we'd left DH minding the bags we needed to get back to him. 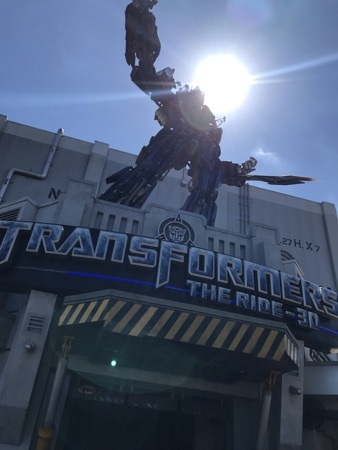 The next attraction that we came to was Transformers. This was another one that we'd never tried before - I'm not sure whether it hadn't opened in 2012 or whether it was just so busy that we didn't bother. 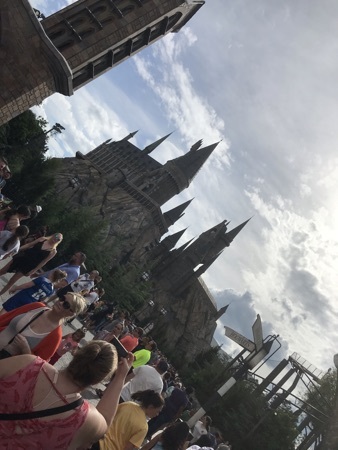 It was showing a 55 minute wait today but the park was now getting so crowded that we realised that we wouldn't get anything done if we didn't brave a few long queues. 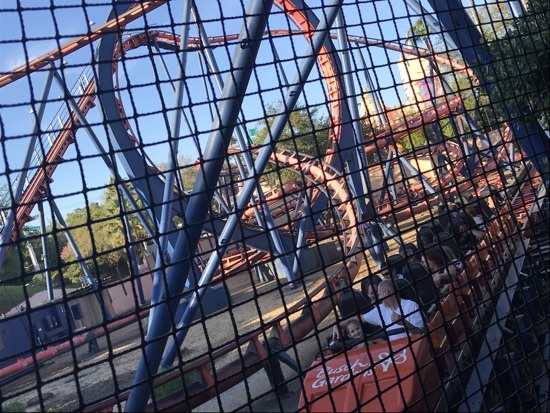 We'd already been in the queue for about 10 minutes when we heard a safety announcement warning that it wasn't suitable for people who suffered from dizziness or motion sickness. This was enough for DH and he decided that he just couldn't face it so he went back outside and left me and DD to it. We both thought that it was brilliant and were glad that we'd done it. 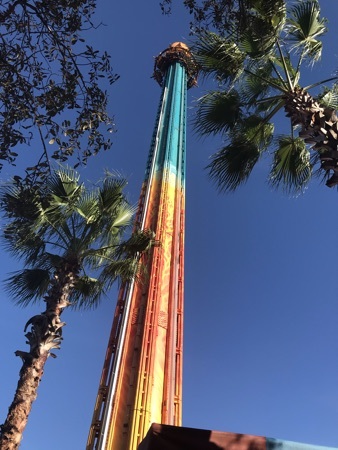 However, between this and Rip Ride Rockit, DH had now spent the best part of 2 hours sitting around waiting for us so we needed to find something that we could all do together. We were going to try Fast and Furious but they were having technical problems and it was closed. By now it was very hot and we were all getting fed up, we seem to have bypassed half the park and ended up in London! 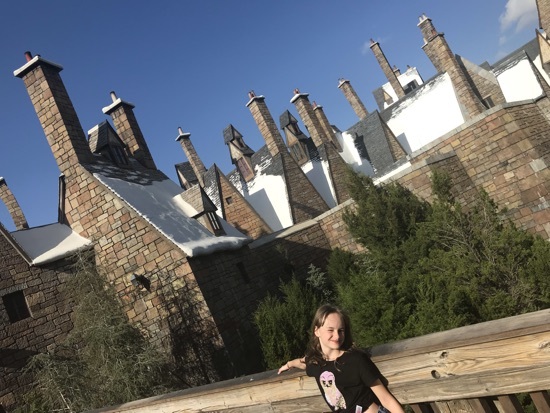 DH had her photo taken outside Grimauld Place and we headed into the Wizarding World. I really wanted this part of the park to be magical and to be able take the time to do it justice. But there were so many people that it was impossible to get a clear photo of anything never mind a close look and DH was in no mood for being dragged in and out of shops! These are just about the only pics that I managed to get without thousands of other guests in the way! 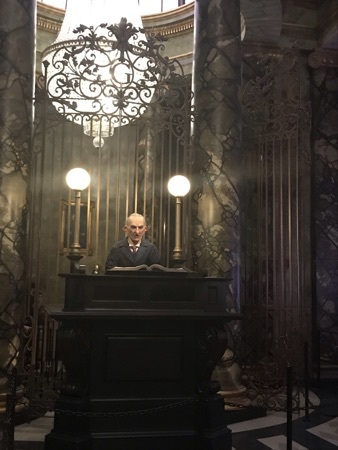 We arrived at Gringotts and the wait time was over an hour - this is usually our maximum - but as we were here I was determined to do it. DH wasn't very happy but agreed to accompany us rather than wait out again. Because we were all riding, the bags had to go in a locker. This cost us $2 as our back pack was too big for the free lockers. I almost locked our park tickets in the locker, thankfully realising at the last second that I'd need to scan the barcode to open it again. 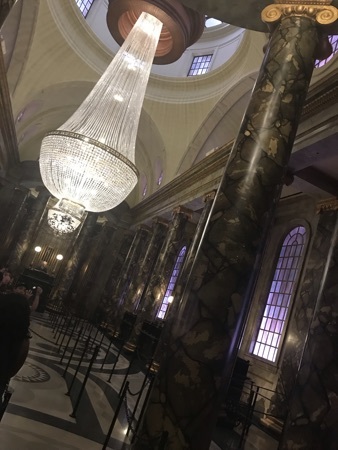 It was only once we were in the queue that I realised that I had left my phone in my bag in the locker, so couldn't take any photos inside Gringotts at all - today really wasn't going well! The inside of the bank is stunning and we really enjoyed the ride once we were eventually on it. 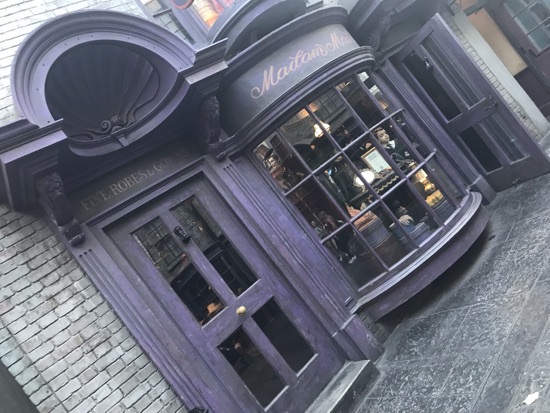 The attention to detail in this area lived up to my expectations and I really do want to come back and see it properly when it is less crowded - not sure yet if time and DH will allow for this! 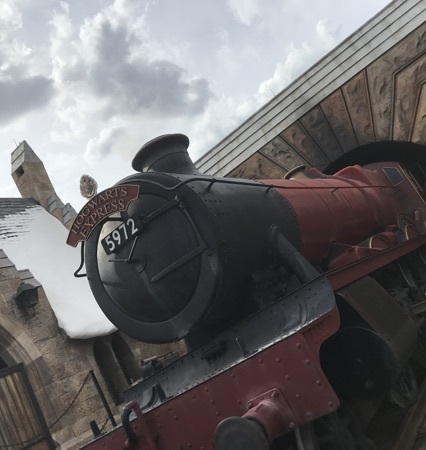 Once we'd finished with Diagon Alley we decided to join the queue for the Hogwarts Express and see if Islands of Adventure was any less busy. 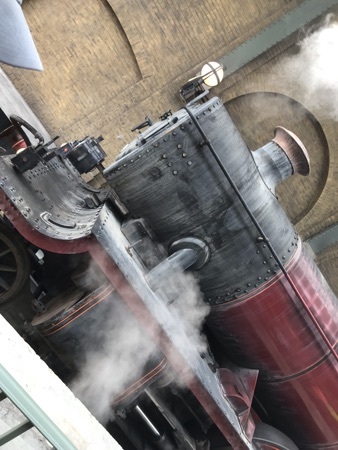 It was very hard to get a decent photo of the train itself - when you are at the front of the queue it is too large and too close to get it all in shot. From further back there are too many people in the way! So I settled for the stationary one on arrival. 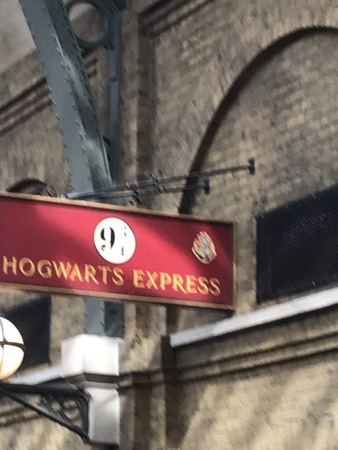 The train ride was fun but if anything, Hogsmeade was even more crowded than Diagon Alley! 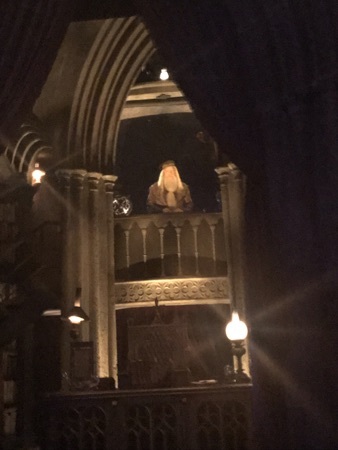 I took a few pics but DH had no desire to ride Forbidden Journey again so we pretty much sped through. 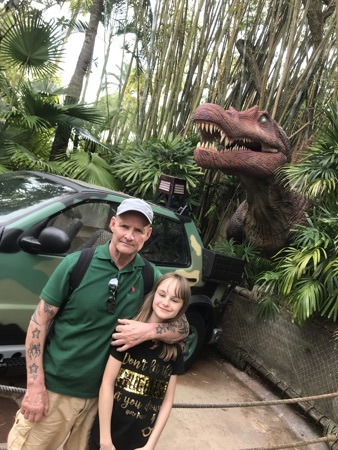 We were going to do Jurassic Park River Adventure - we love this ride but DD wasn't tall enough last time - however there wasn't even a wait time posted, the sign just stated that there were unusual delays! 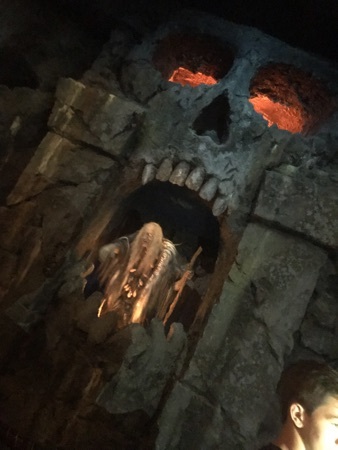 We headed for Skull Island and Reign of Kong which would've been another new experience for us. However the posted wait time was over an hour and we just couldn't face it. At this point we decided to give up. We were hot and tired and in nearly 6 hours had managed just 5 rides (DH only 3). I can honestly say that for the first time in my life I had spent a day in a theme park and really not enjoyed it. 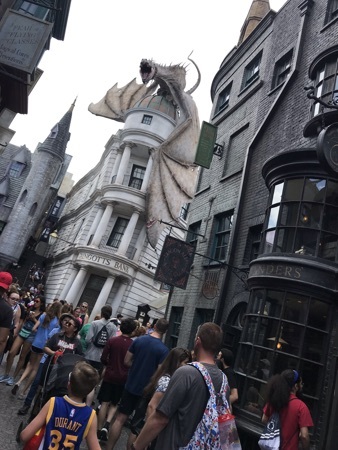 There were highlights - Transformers & Escape from Gringotts were both great - but they were few and far between. With the benefit of hindsight it was a bad idea to attempt a park on a Saturday but even if the crowds had been lighter Universal now has too many simulator based rides to make a good day out for DH. We got an Uber back to I-Drive rather than waiting around for the return shuttle bus. 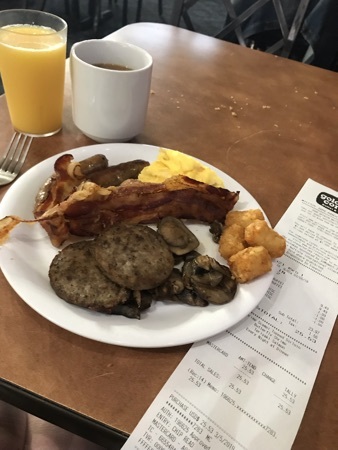 This cost $7.60 and we asked to be dropped off at Perkins across the road from our hotel as I had a 20% discount voucher. It was so good to be seated in a comfortable, air conditioned building! DH and I both ordered from the $9.99 burger and pie menu. 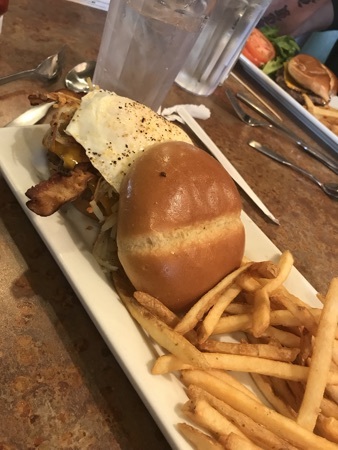 I had the breakfast burger. This was a thick, juicy burger with bacon, hash browns and a fried egg. It was delicious. He also ordered an extra portion of fries. 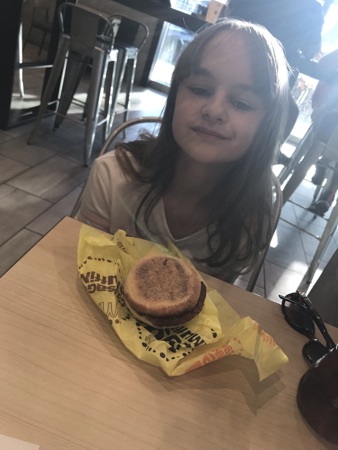 DD had the kids cheeseburger meal minus the cheese. 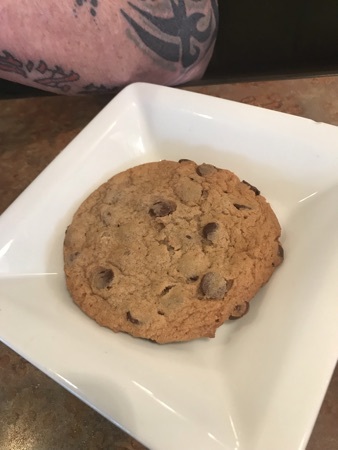 This came with a drink and a huge choc chip cookie. 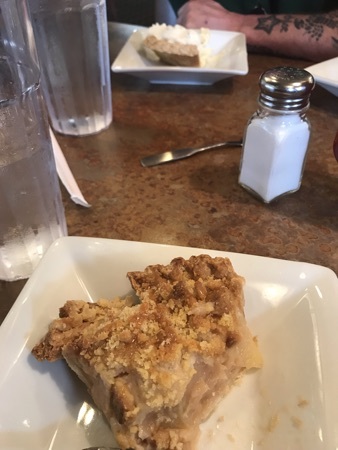 For dessert I had the caramel apple pie and DH had the Banana Cream Pie (what else?!). Sorry, we'd both started eating before I remembered to take a photo. We all agreed that these meals were excellent and exceptionally good value. The burgers are the best that we've had since we've been here. Our bill came to $27.44. Unfortunately, because we'd eaten off the special offer menu, we couldn't combine this with my welcome discount. 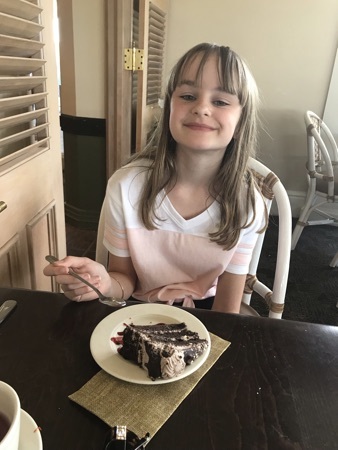 So the 20% was only deducted from DD's meal - I wouldn't have bothered using it if I'd known - but the food was well worth what we paid anyway and we left a $5 tip. ... we all fell asleep and by the time any of us woke up again it was 8.30. We stopped in the room and watched Dumb and Dumber on TV. I've seen this film many times before but it still makes me giggle. 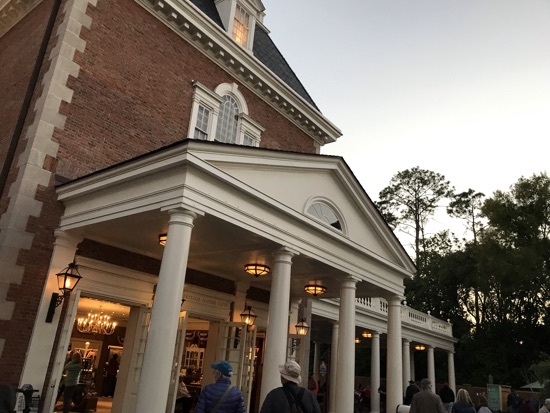 After today's experience DH has decided that, tomorrow, he needs a complete break from the parks and wants to stay at the hotel. 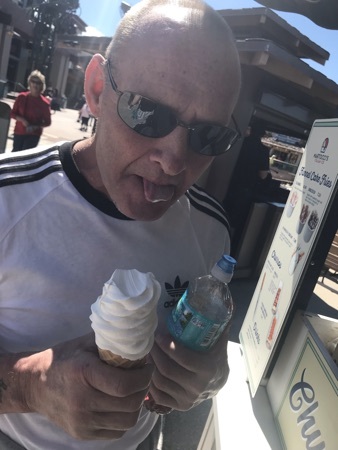 He says he isn't bothered if DD and I go off and do something without him - if the truth be known he'll probably be glad of the peace and quiet! So we're going to take the chance to go to Busch Gardens for the day. In all our previous trips to Orlando we have never visited The Mall At Millenia. This was mainly because it isn't on a convenient bus route from I-Drive and we didn't have a car. 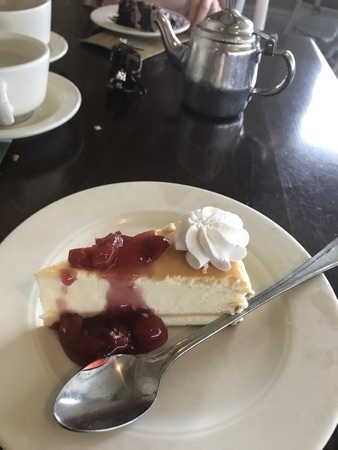 On this occasion we (... well I really) have been tempted by a combination of cheap Uber fares and the lure of free cheesecake! DD began the day with a breakfast of the Coco Pops that she'd brought back from yesterday's visit to GC. DH and I didn't bother as we knew that we would need room for dessert later. We booked our Uber which cost just $9.94. We had a very chatty driver who was telling us all about how he is semi-retired but has moved to Florida to live near his son. He is renovating a boat to live on - sounds like heaven! 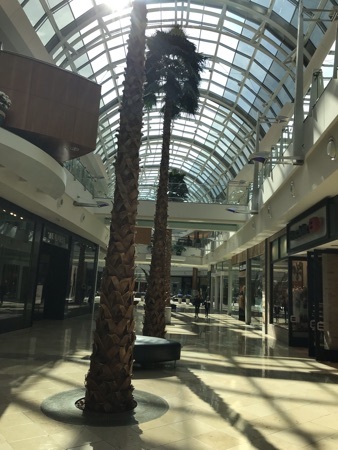 The Mall is bright, modern and very light thanks to all the glass. Everything is inside. It all looks very high end and is a complete contrast to the designer outlets that we have been used to. Unfortunately, the prices reflect this! 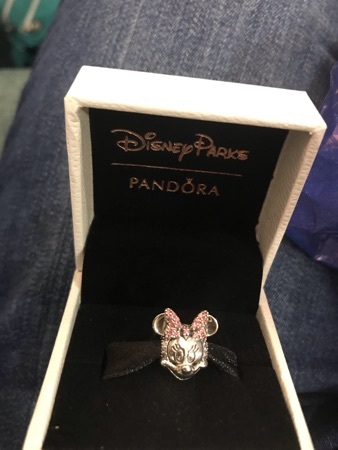 I was tempted to buy a Mickey head charm from Pandora for my bracelet but they had nothing that I couldn't have bought in the UK so I decided to wait till we visit Disney Springs to see if I can get a WDW exclusive. This set the tone for the morning and was repeated in several other shops. 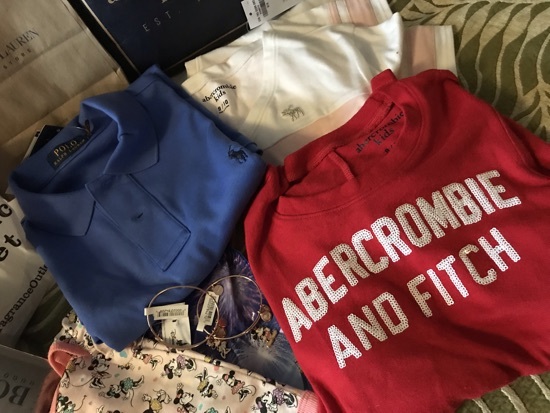 We did buy a couple of things in Abercrombie & Fitch kids. 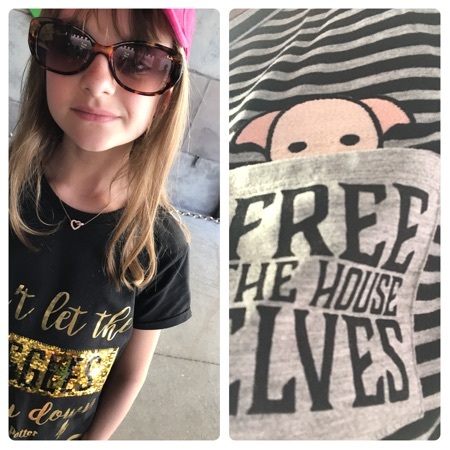 DD found a t-shirt that she liked for $17.99 and I bought her a jumper that was marked down to $12.99 in the sale. 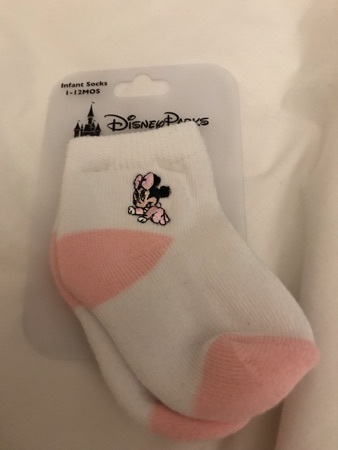 Our only other purchases were from Forever 21 where DD bought herself a set of rings for $5.90 and I found myself some Mickey Mouse socks - I needed these desperately as my sandals were rubbing my feet badly but I hadn't fetched enough socks with me to wear trainers every day of the holiday. I paid $7.99 for 4 pairs. 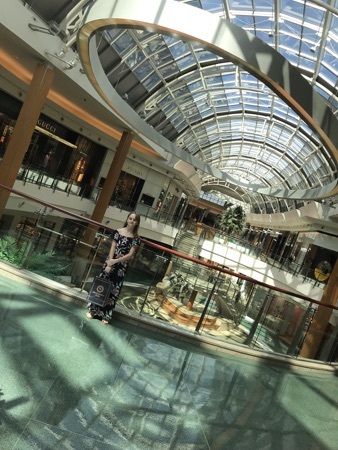 The Mall was very quiet and we spent a while window shopping in the likes of Rolex and Louis Vuitton deciding what we'll buy when we win the lottery (highly unlikely as we've never played it!). 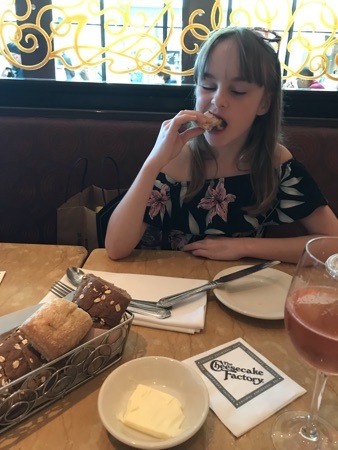 It was soon lunchtime and we headed to The Cheesecake Factory. We were seated very quickly and our server brought out the bread basket while we decided what to order from their vast menu. I chose the Carne Asada Steak Medallions. These are sautéed with peppers, onions and cilantro and come with a spicy Ranchero sauce. 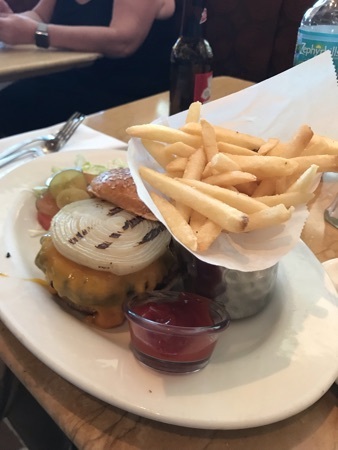 It is usually served with sides of corn and white rice but I asked to swap the rice for fries. It was delicious. There were so many dishes on this menu that I would've liked to try but I think that I chose well. 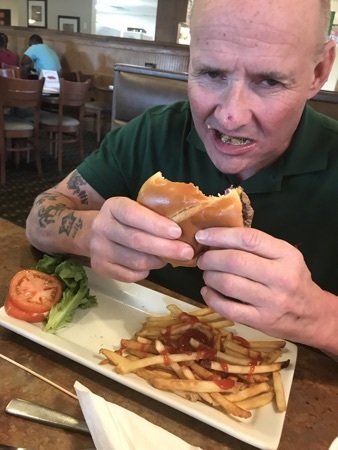 DH had the Classic burger which he enjoyed with a couple of bottles of Bud. 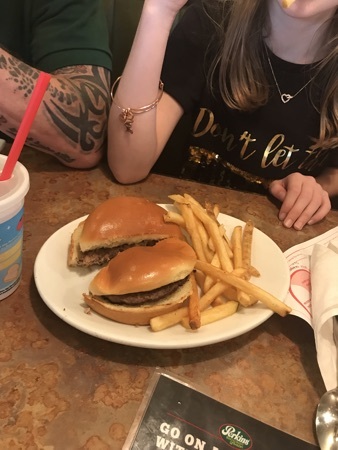 DD had the kids roadside sliders with fries. These are described as bite sized burgers but each one would've made a regular burger back home. She did well to eat them both. Now on to the main event! 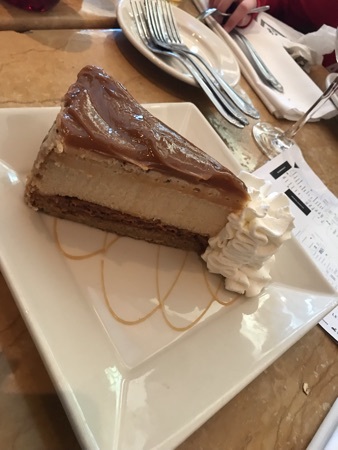 I had pondered long and hard about which cheesecake to try and eventually settled on the Salted Caramel. DH went for the White Chocolate and Raspberry which would probably have been my second choice anyway. We ended up sharing these and I'd be hard pressed to say which I preferred. They were both heavenly! 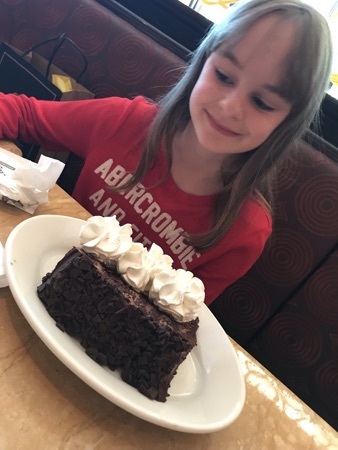 DD didn't fancy any of the dessert options on the children's menu so asked for a slice of Chocolate Tower Truffle Cake. This was almost as big as she is! We had most of it boxed to go and even though she had another go at it when we got home last night there is still some left in the fridge now. I had mentioned to our server at the start of the meal that we had 2 Slices of Joy vouchers from the Black Friday promotion to redeem. 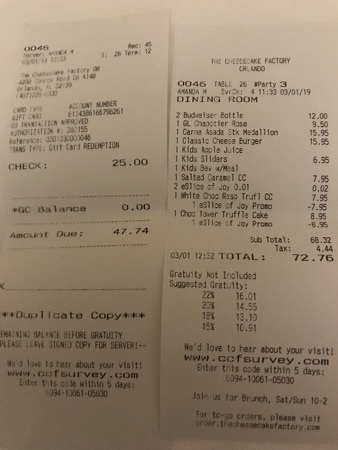 She took down my voucher numbers and there was no problem using them both for the same meal despite the fact that the small print states one per guest. This left us with a total bill of $72.76. I used my $25 gift card towards it, leaving us $47.76 + the tip to pay. We had fallen into the trap again of ordering drinks with our meal and were charged $9.50 for a glass of wine and $12 for 2 bottles of Bud - some people never learn! The food though was lovely and I would definitely recommend it. 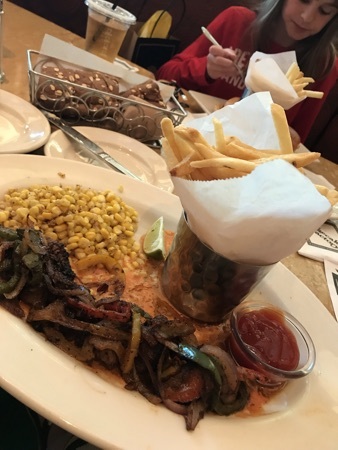 Once we'd eaten we agreed that we'd finished with this Mall and called an Uber to take us to the Vineland Premium Outlets. This cost $18.13. On arrival we headed straight for Nike as DH still wanted some trainers. He found a pair that he likes for $49.99. Next, having decided that I wanted to get DD18 a nightie from Victoria Secrets we decided to look for VS - you might remember I mentioned my mistake earlier - there isn't one! They are in Premium Outlets International but not Vineland. 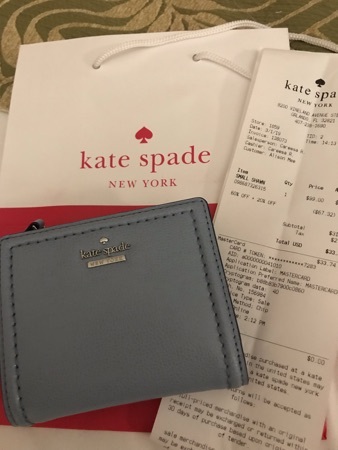 I was delighted to eventually find a Kate Spade purse that was the right size. I was very glad that I hadn't bought one the other day because in addition to the store wide 60% discount they now had 20% extra off purses. I paid just $33.74 with tax. We also picked up a Ralph Lauren Polo for $44.99 as a present for DS Ian. In the Disney Outlet we found a cute Minnie Mouse vest and shorts set for the baby that DS Ian and his wife, Georgie, are expecting this Summer. 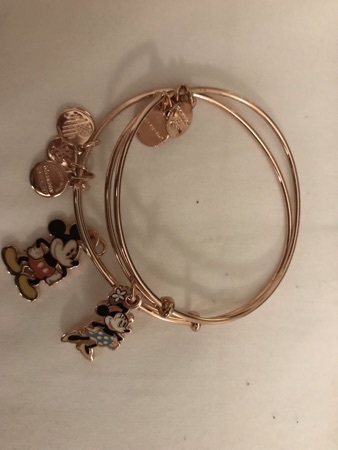 DD and I also bought matching Minnie and Mickey bracelets for $12.99 each. Our final and most expensive purchase here today was from the Fragrance Outlet where DH bought some Boss aftershave and as they had a buy one, get 50% off a second, offer we also got D-i-l some of her favourite Miss Dior perfume. We returned to the hotel on the I-Trolley. This was a much longer journey than any of us remembered. It was gone 5pm when we got back and DH decided that he'd had enough and didn't want to go anywhere this evening. 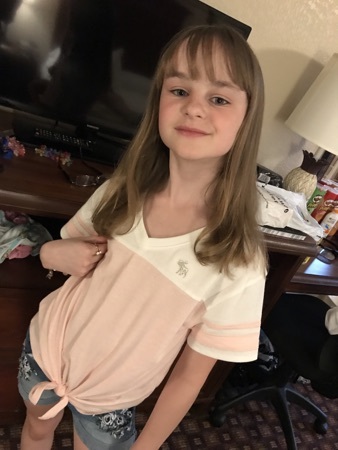 So, after a quick change into her new A&F t-shirt, DD and I decided to go back to Premium Outlets International to see if we could find anything for DD18 in Victoria Secrets. We've never been into this store before and our first impression was that it looked like a jumble sale! There were boxes of stock on tables that had all been obviously rifled through by numerous customers. Sizes were mixed up and it was generally chaos. It took almost an hour to sort through it all and find everything that we wanted. 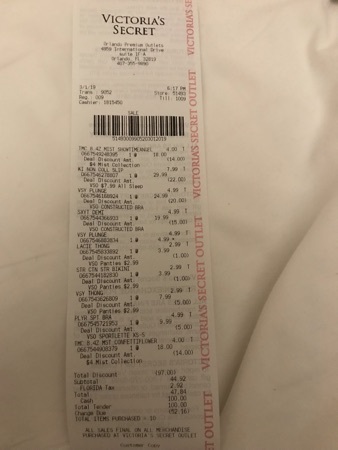 However it was well worth the effort - for the $47 that they wanted for one nightie at the Mall At Millenia store we managed to find DD not only a nightie but also 3 different sets of matching bra and knickers, a new sports bra and 2 body sprays! 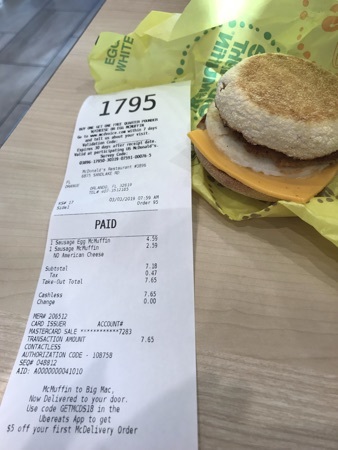 According to the receipt I saved $97. We browsed for a while but my only other purchase was these cute little socks to add to the baby's present. DD spent $10 on a tub of slime from one of the carts. When we were done we left the Mall to look for the I-Trolley stop - and got lost! The car park looked completely different in the dark and we'd come out of the Mall by the wrong exit. It took some time to realise my error and I was starting to panic. It was 8.30 by the time we got back to the hotel and DH said that he thought we'd got lost - so I had to admit that we really had! I nipped over to reception to book us onto the free shuttle for our first visit to Universal Studios tomorrow. 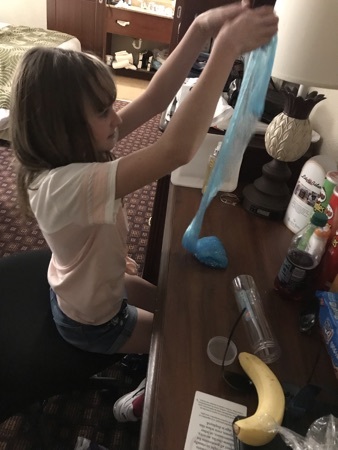 DD was happy to settle in for the rest of the night and play with her newly purchased slime so DH and I relaxed over a drink and some music. I think that these rest days are becoming more exhausting than the parks! 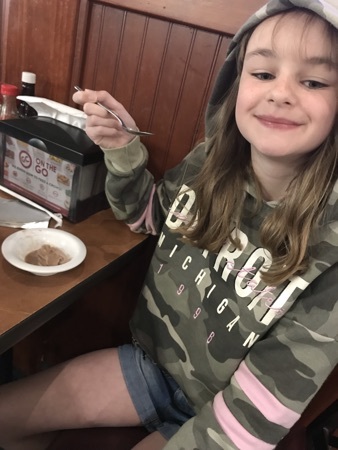 ... and Then There Were 3, Orlando Feb 2019 - Day 5 - Seaworld & Golden Corral Brekkie. A Complete Novice In New York - Day 6 A Station, A Library, A Park And Way Too Much Walking! 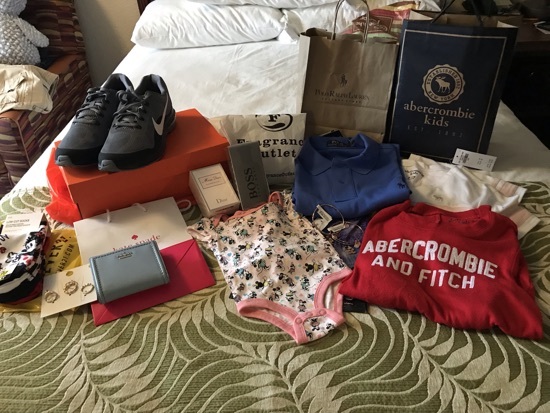 A Complete Novice In New York - Day 5 Woodbury Common, Macy's And Just A Little Bit Of Shopping! A Complete Novice In New York - Day 3 Statue Of Liberty, 9/11 Memorial And Brooklyn Bridge. A Complete Novice In New York - Travel Day Part 1, We're Off!